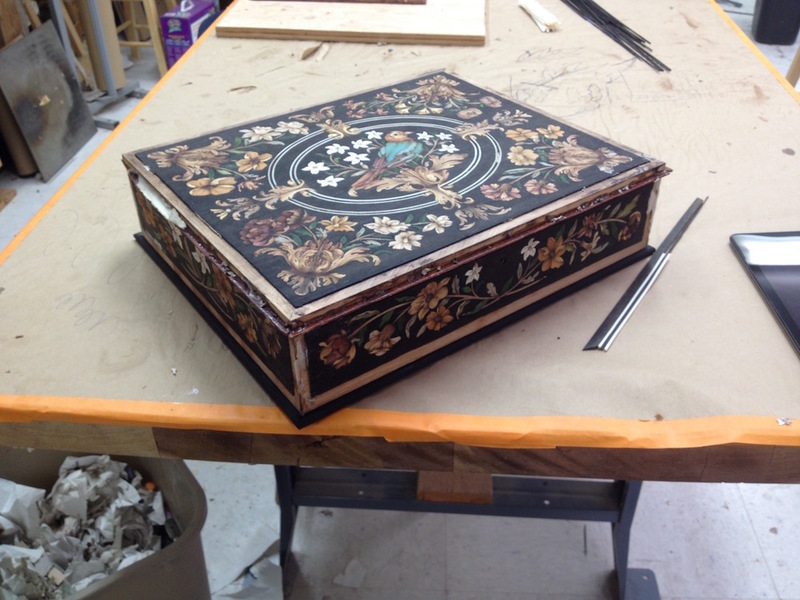 Patrick Edwards and I started this project 2 years ago after completing our first series of 4 treasure Box. 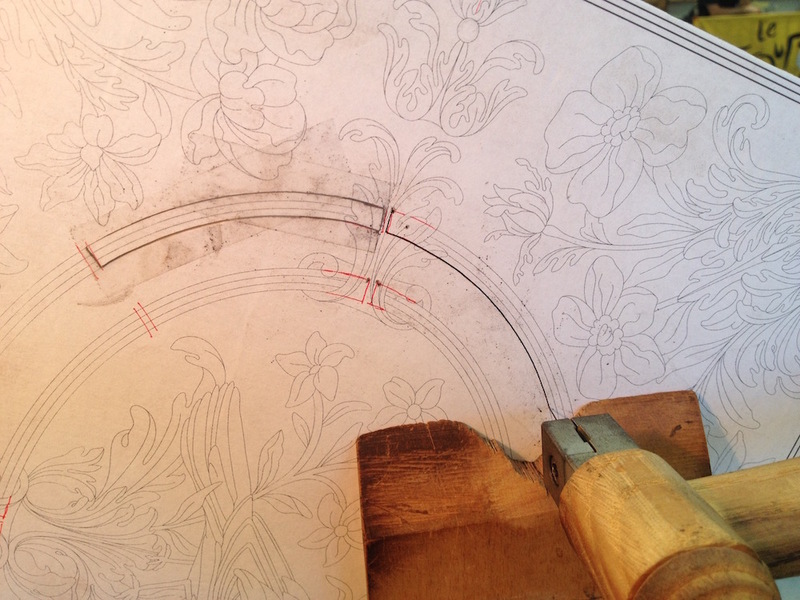 The series II was designed after falling in love with an antique we discovered through an auction house website. 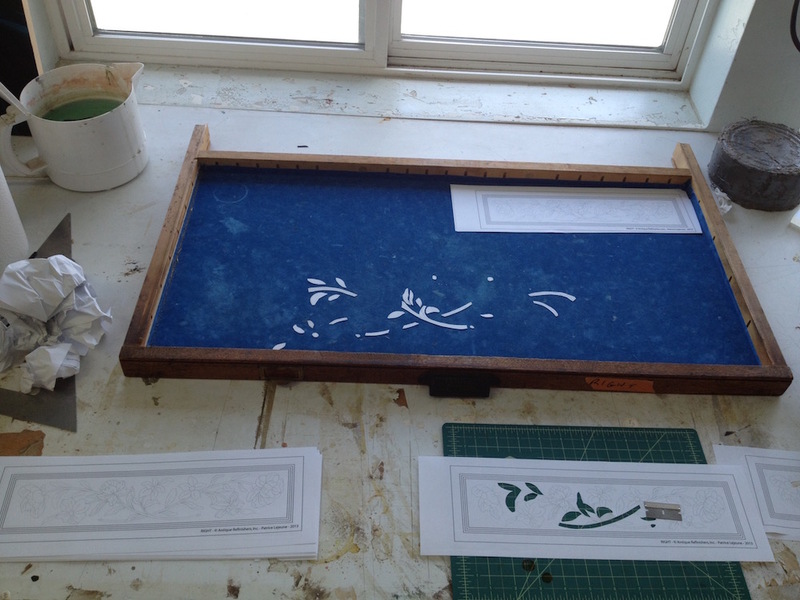 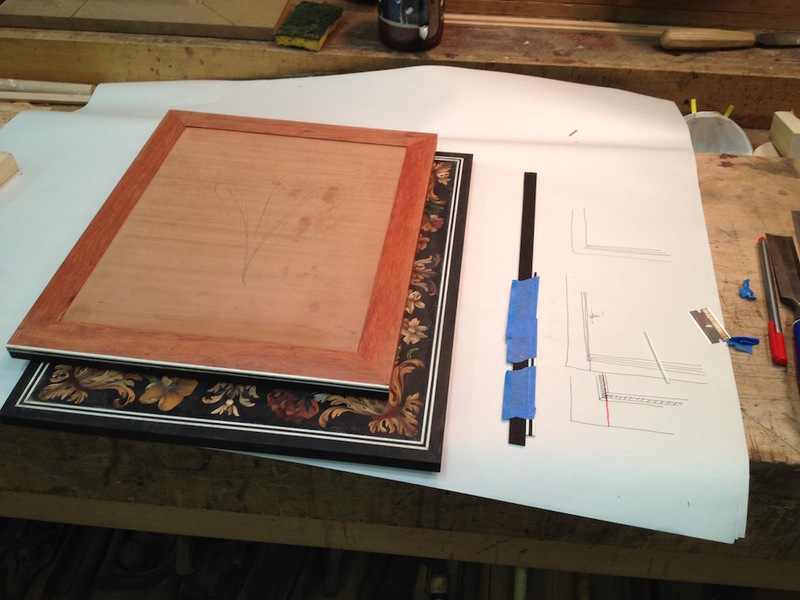 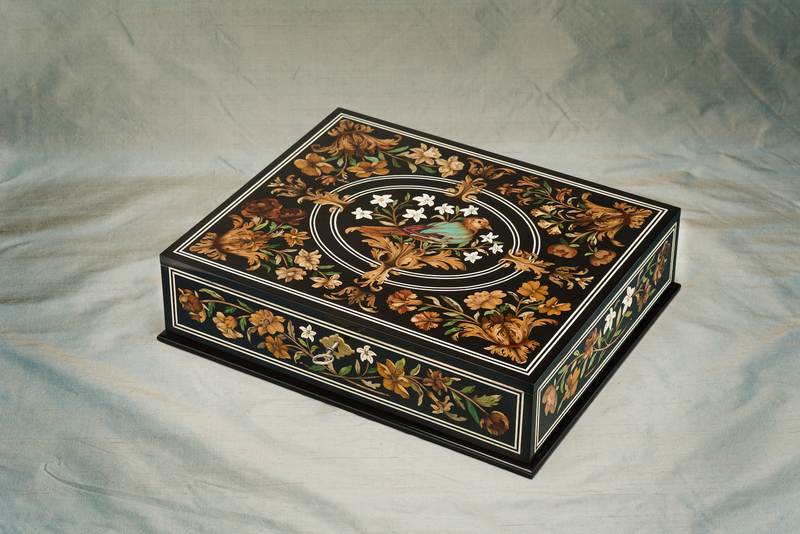 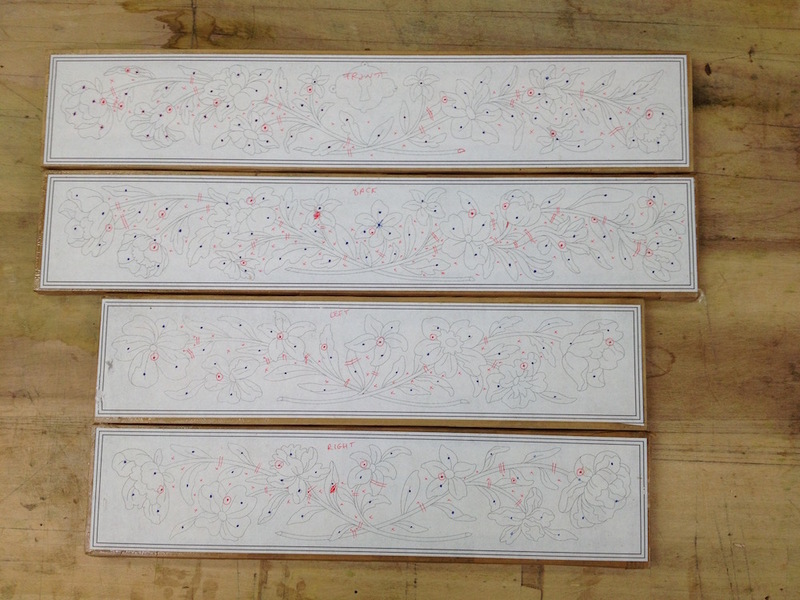 Patrick and I decided to design our new Treasure Box using this general layout and the use of white and green bone inlay. 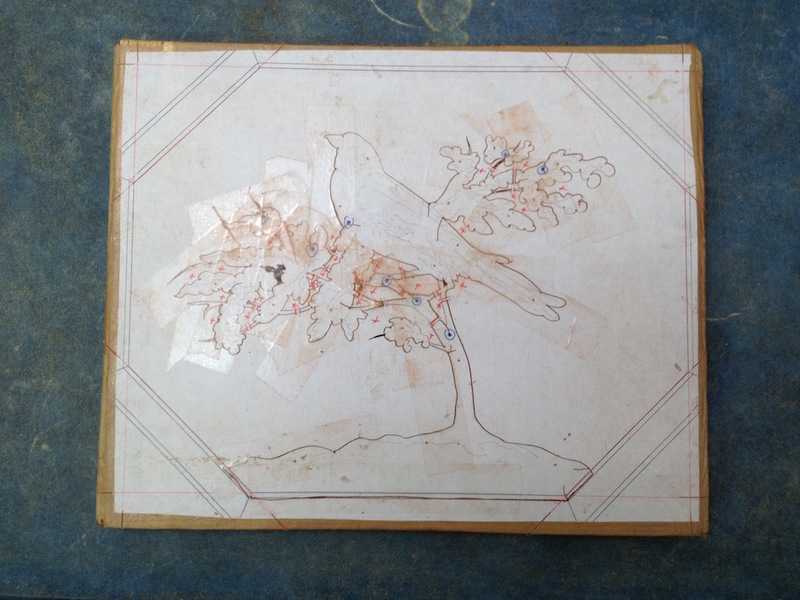 This is not a copy, it is what we call a Re-Creation as none of the original design was used, only the general idea and concept was used as an inspiration. 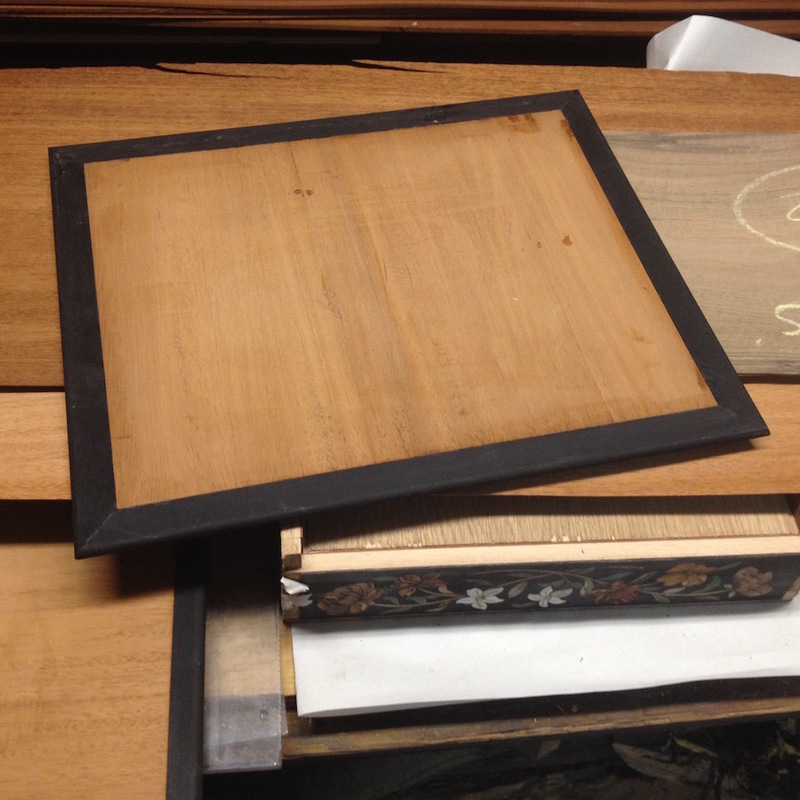 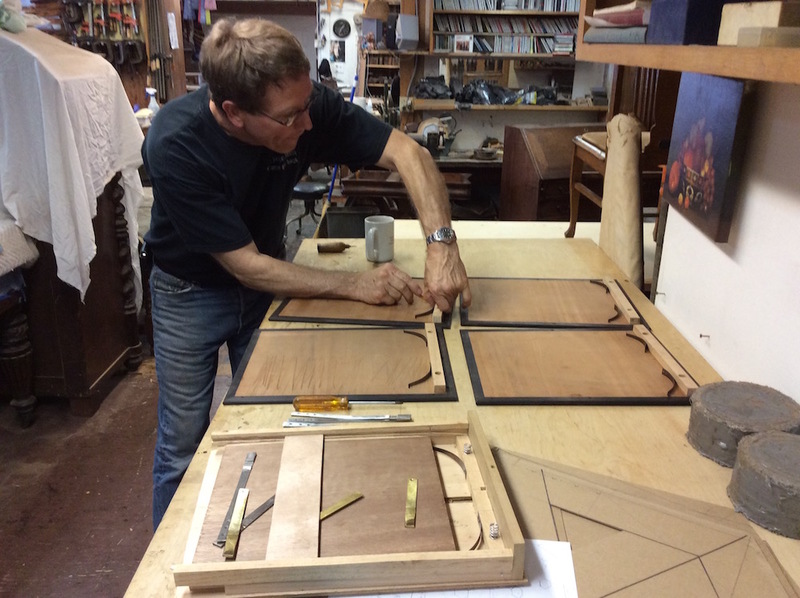 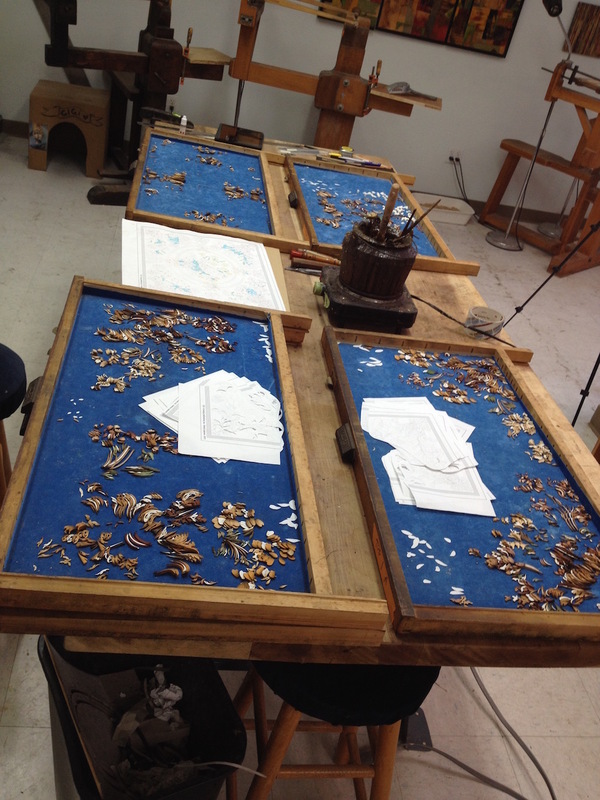 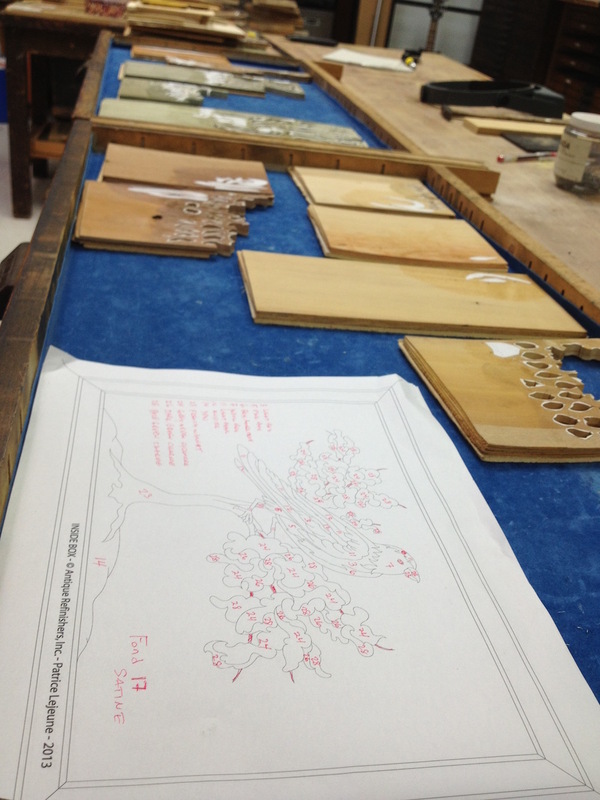 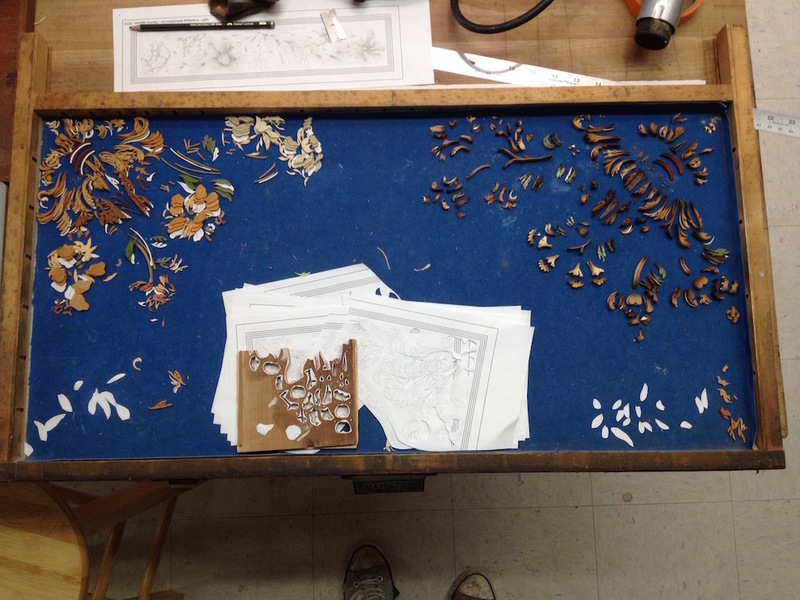 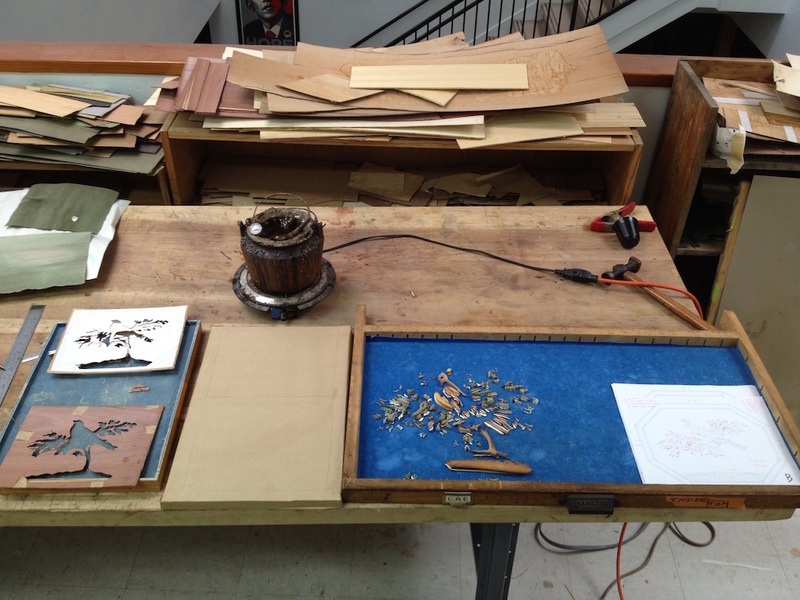 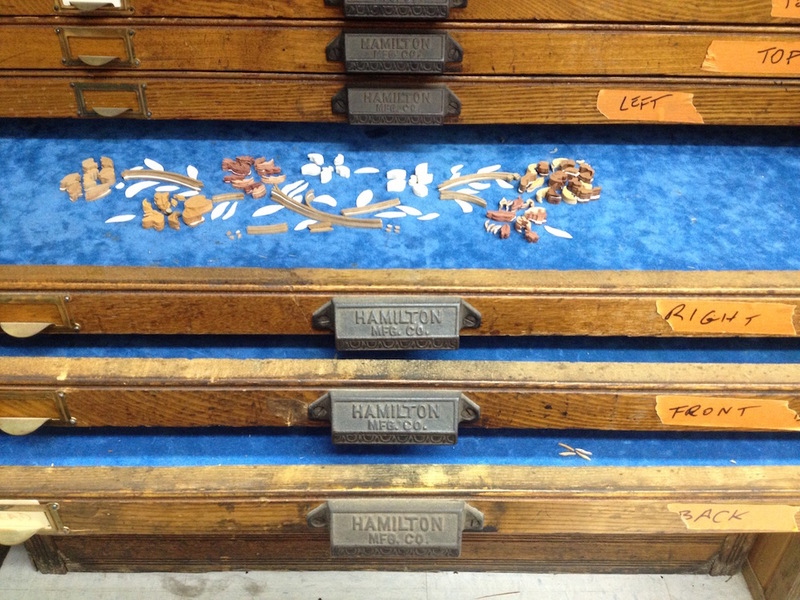 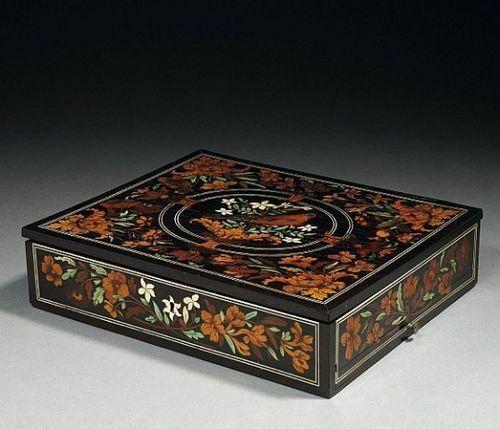 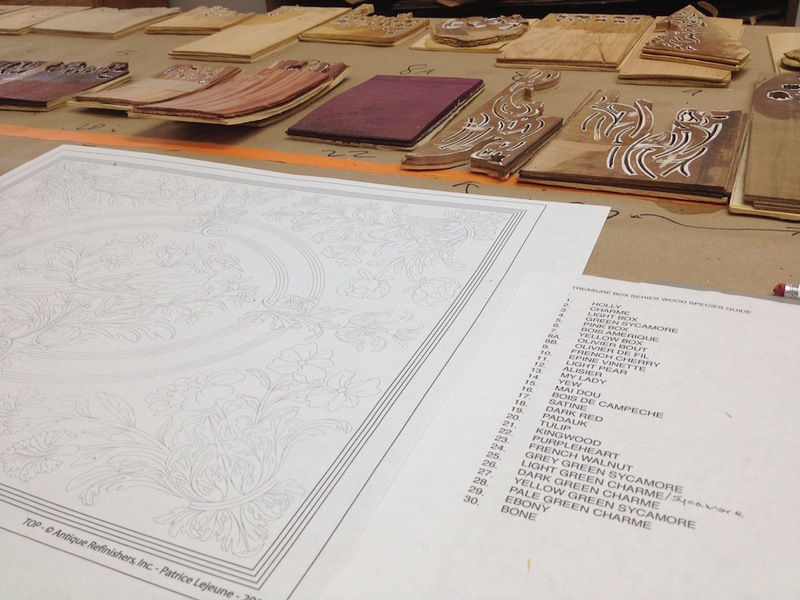 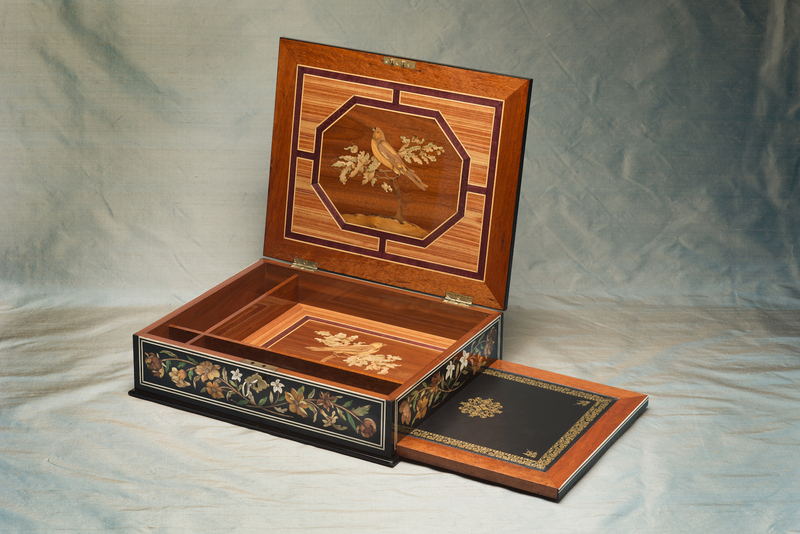 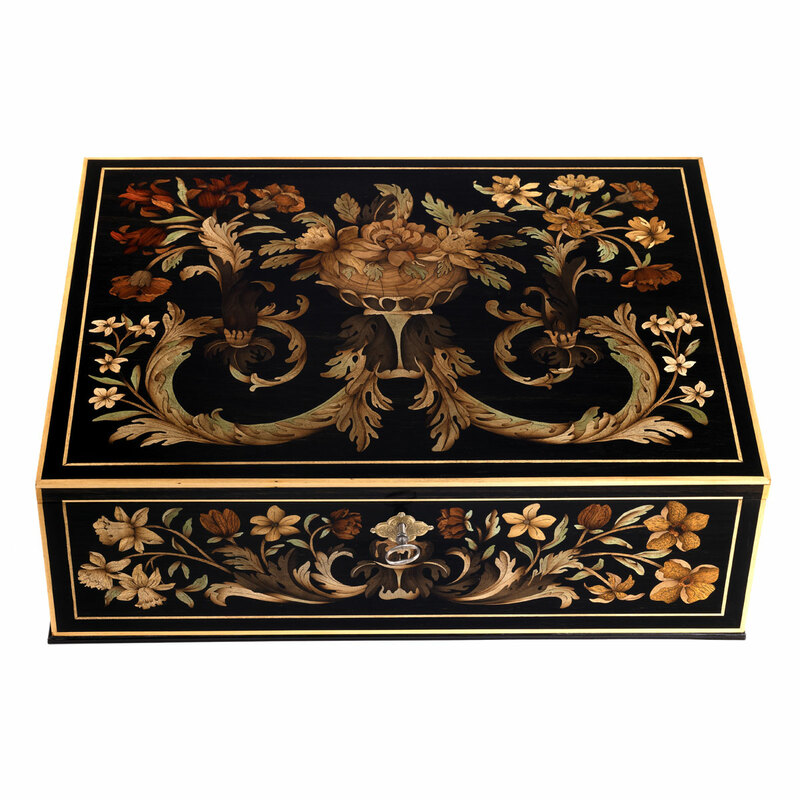 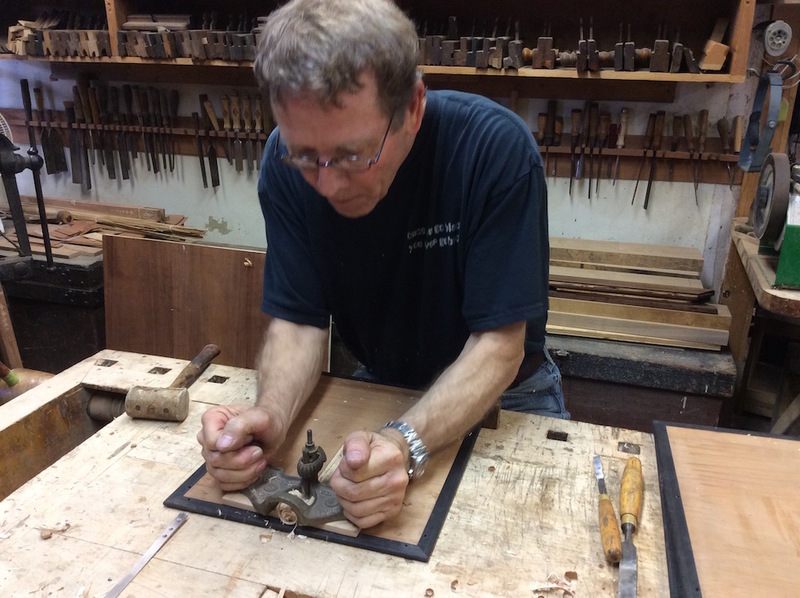 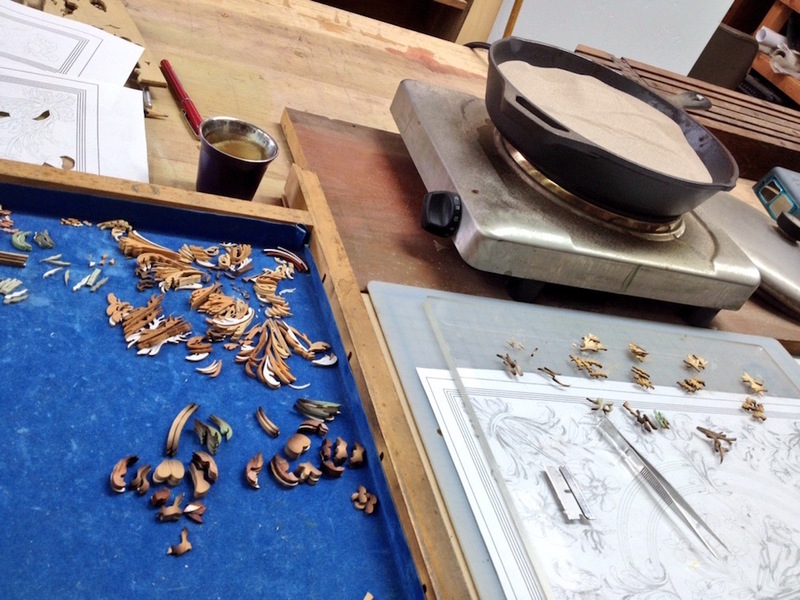 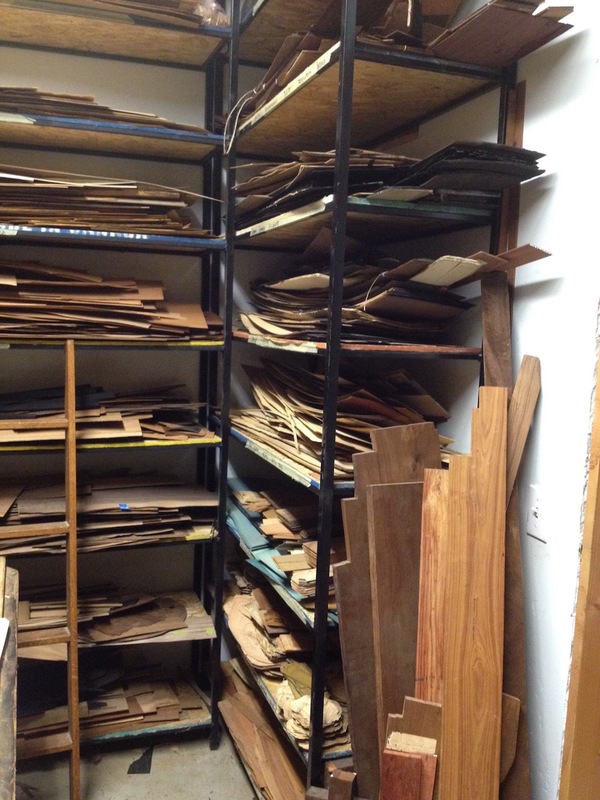 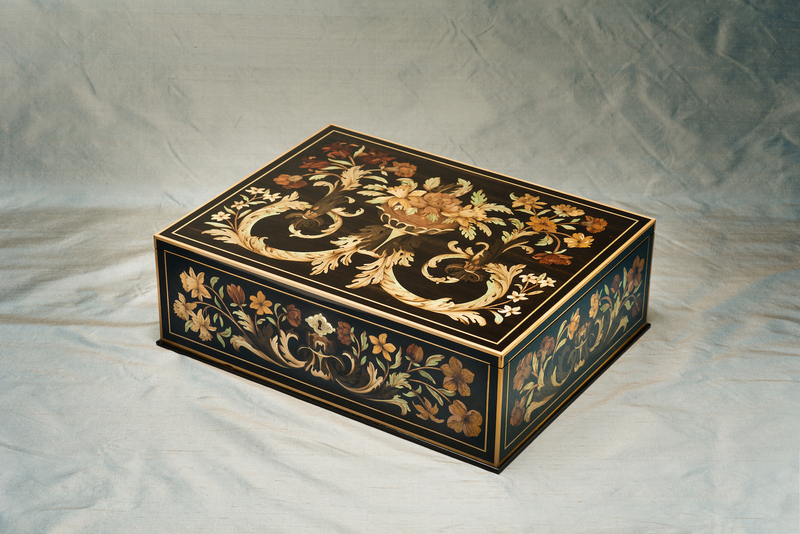 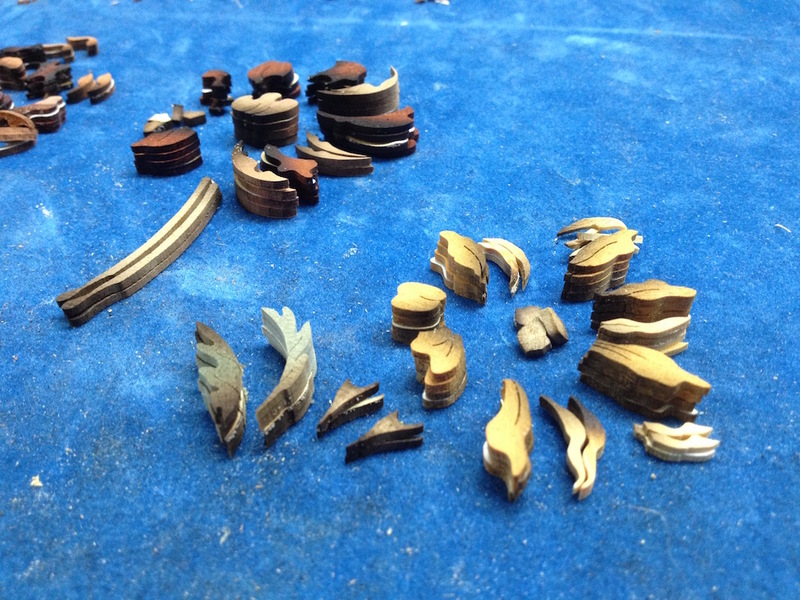 We use a type set cabinet to organize and keep our marquetry. 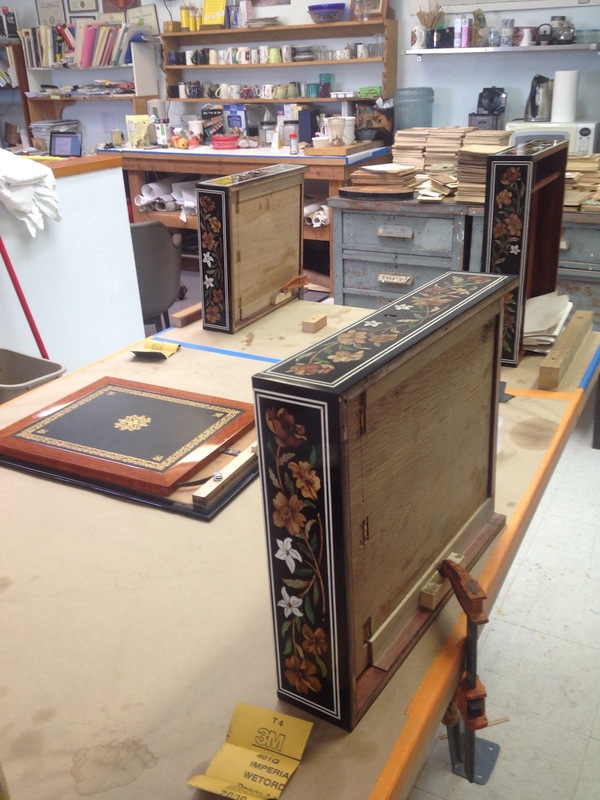 One drawer for each sides, 2 drawers for each of the inside pictures, and for the top, being pretty busy, we used 4 drawers just for it. 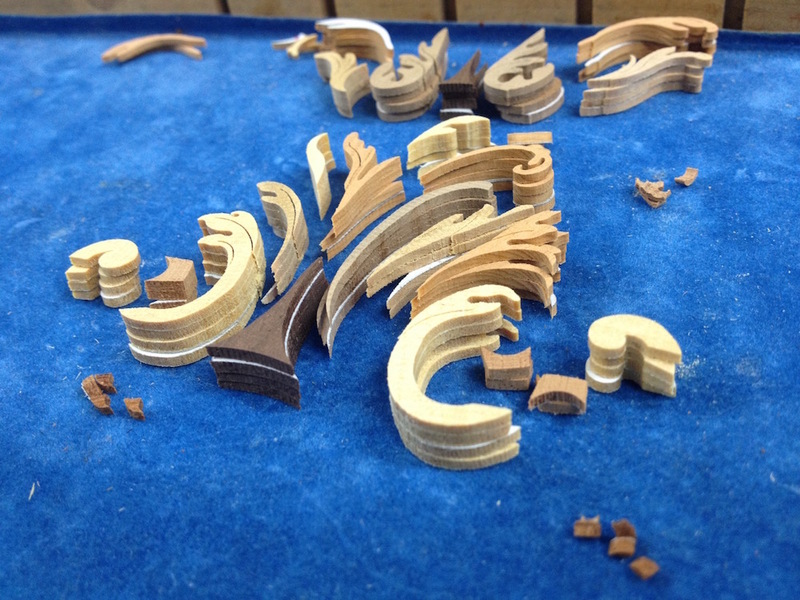 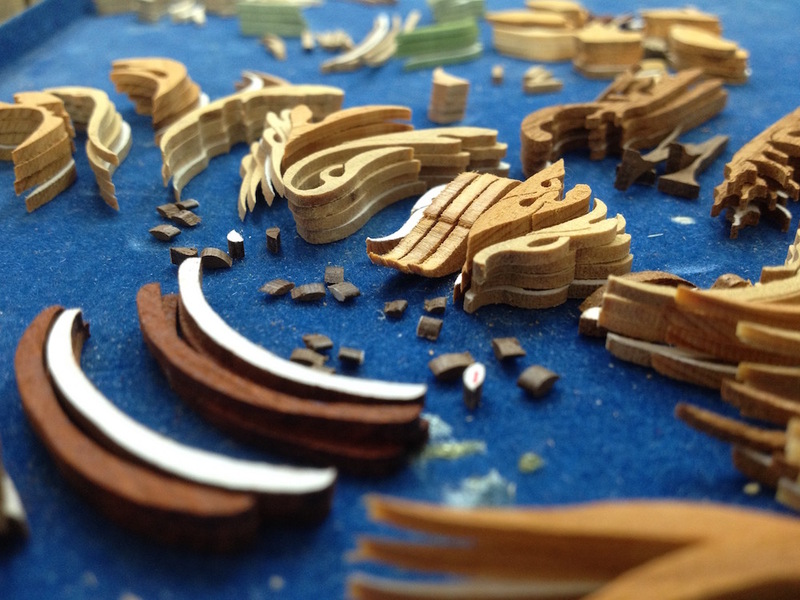 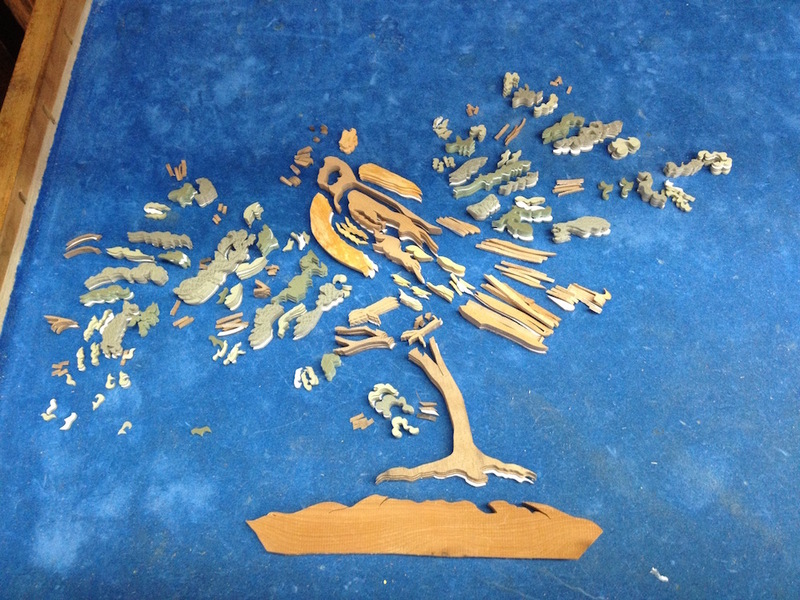 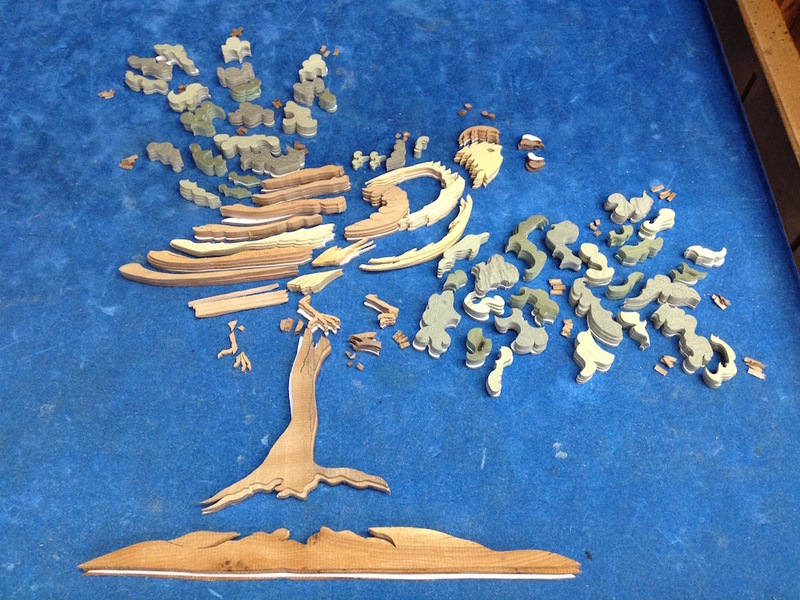 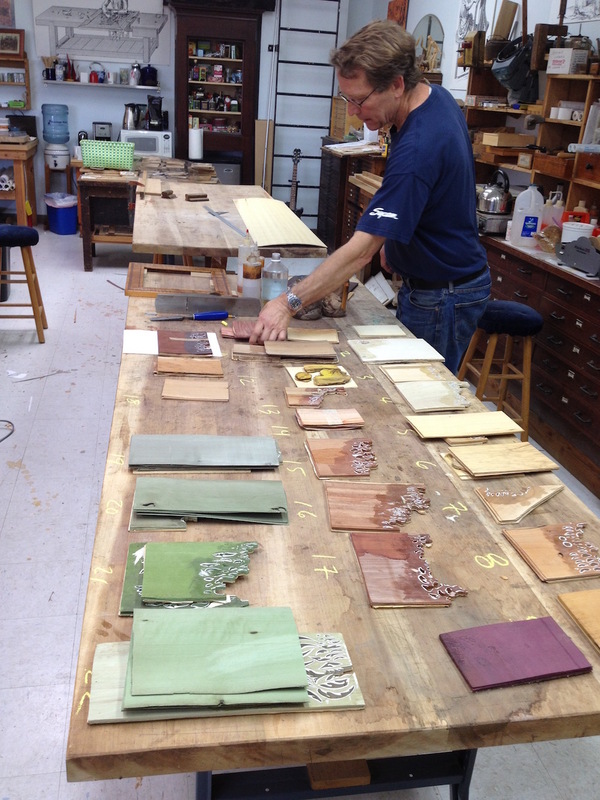 Patrick had organized all our veneer packs to create our palette and choose the woods. 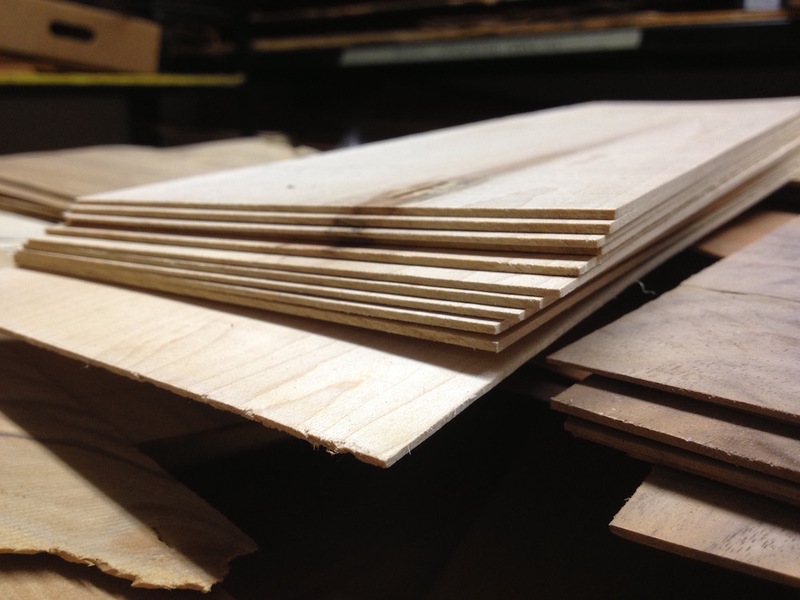 We are making 4 boxes so all our pack will be 4 layers of veneer thick to create simultaneously 4 exact same pieces in one cut. 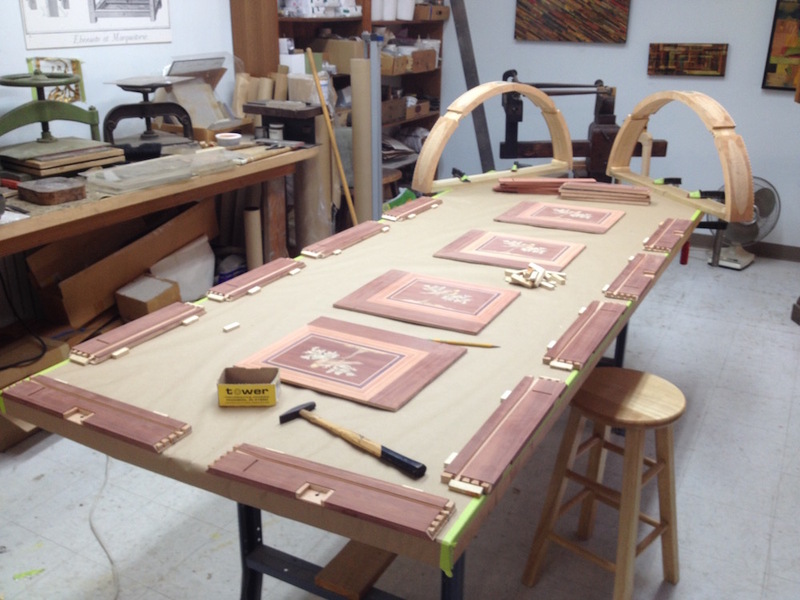 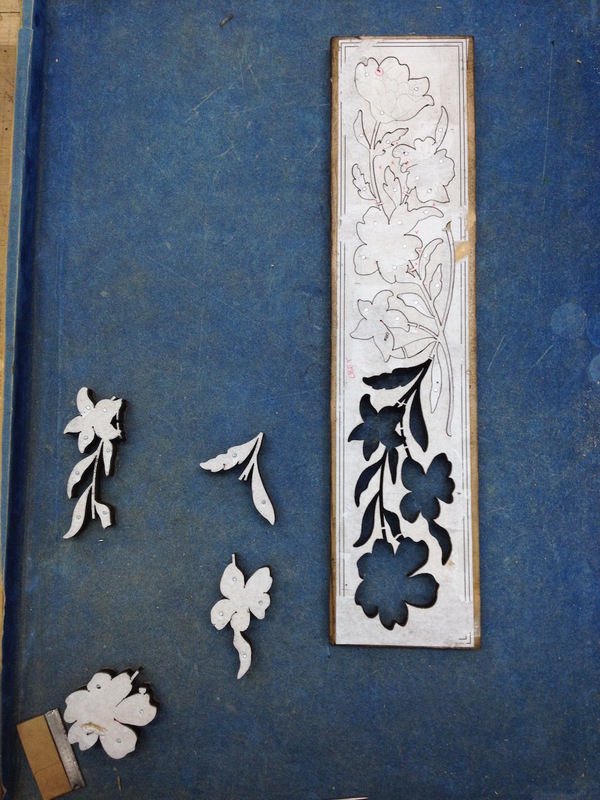 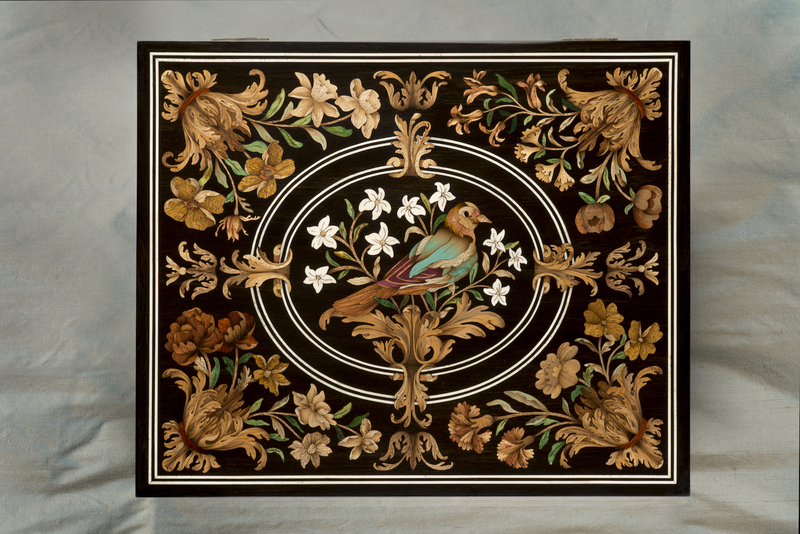 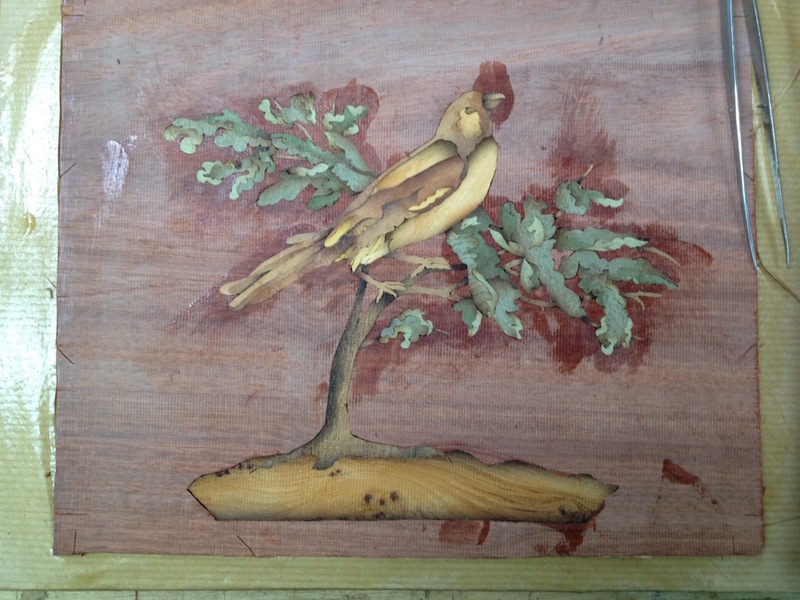 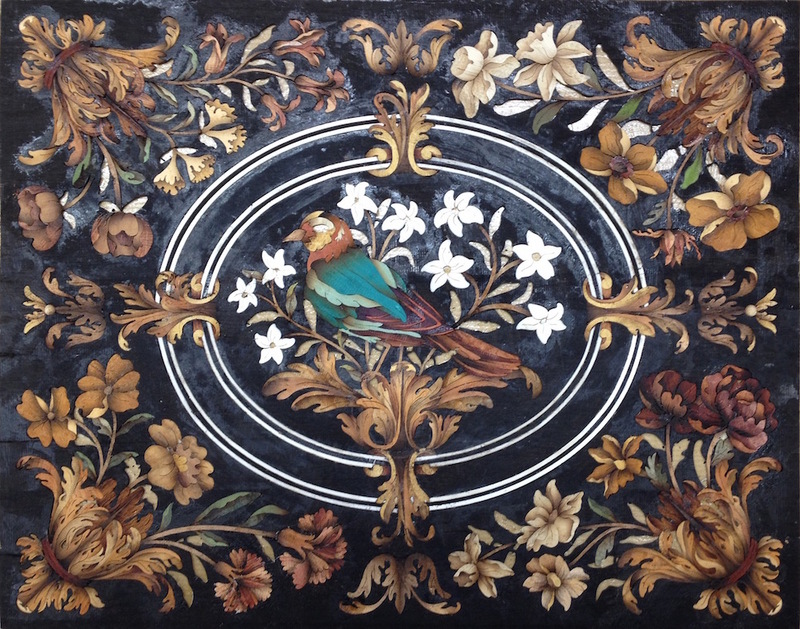 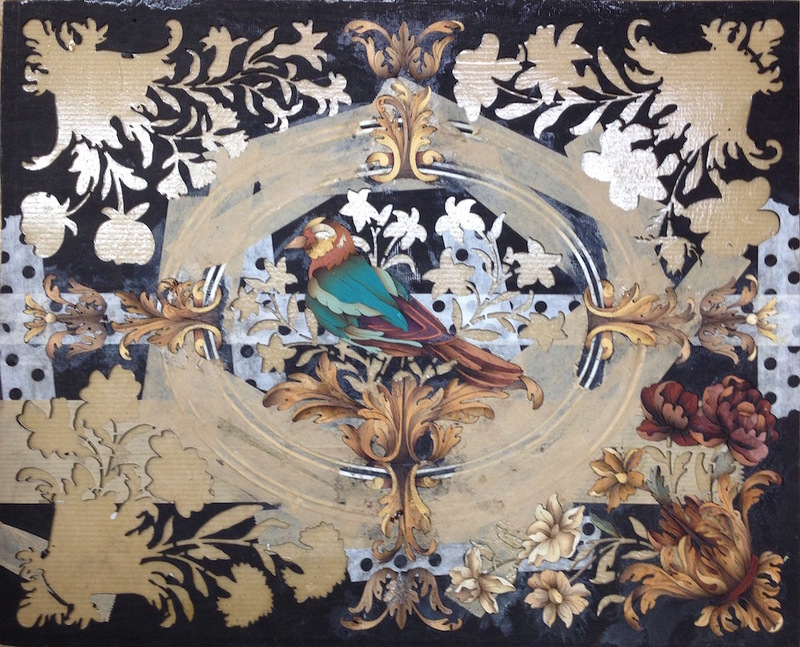 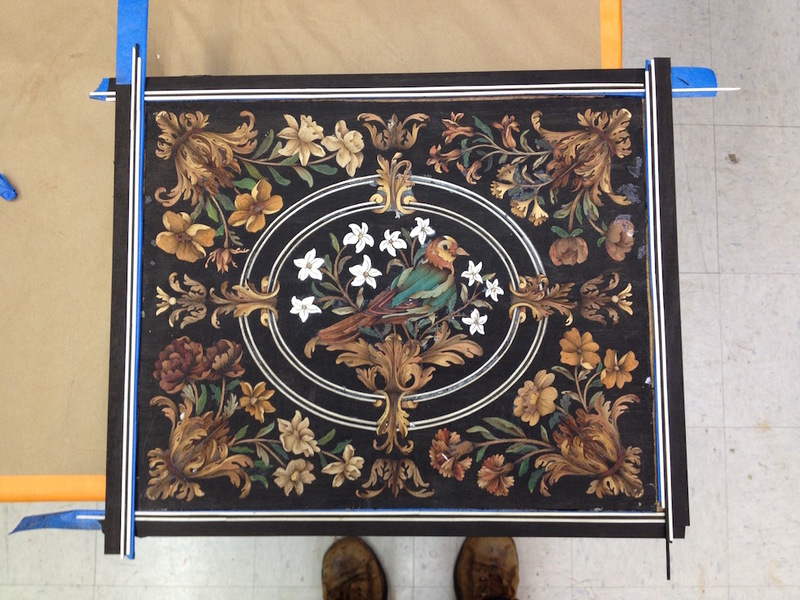 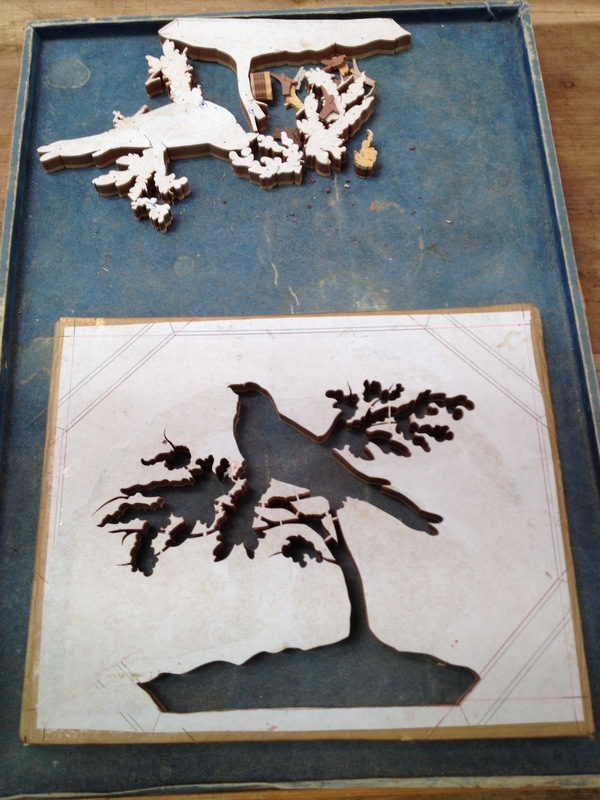 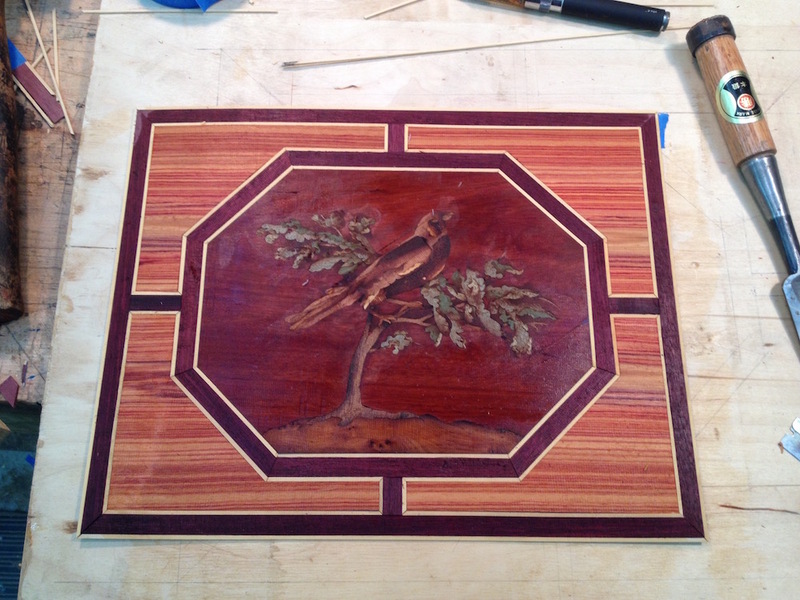 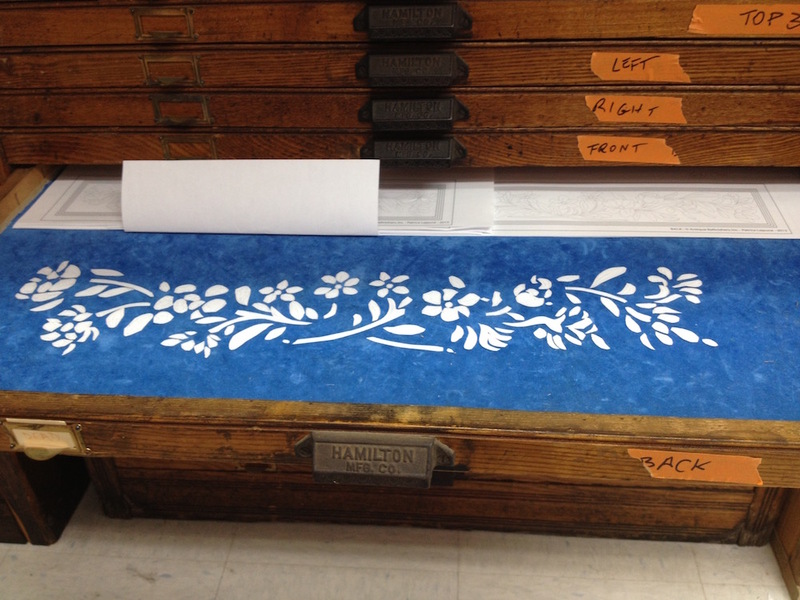 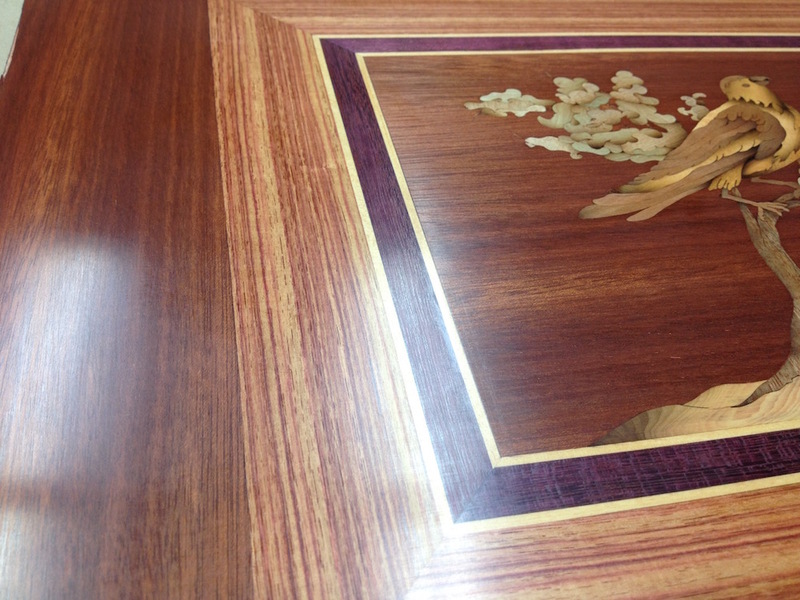 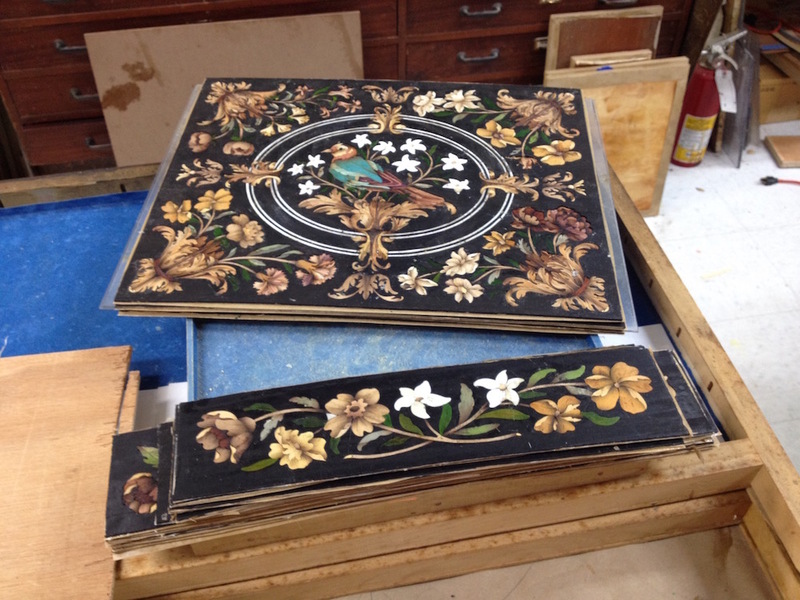 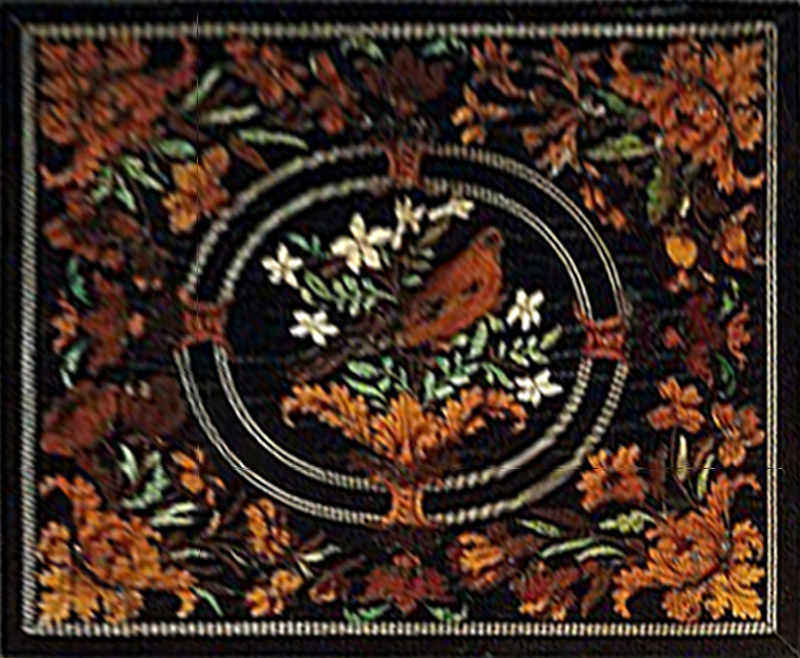 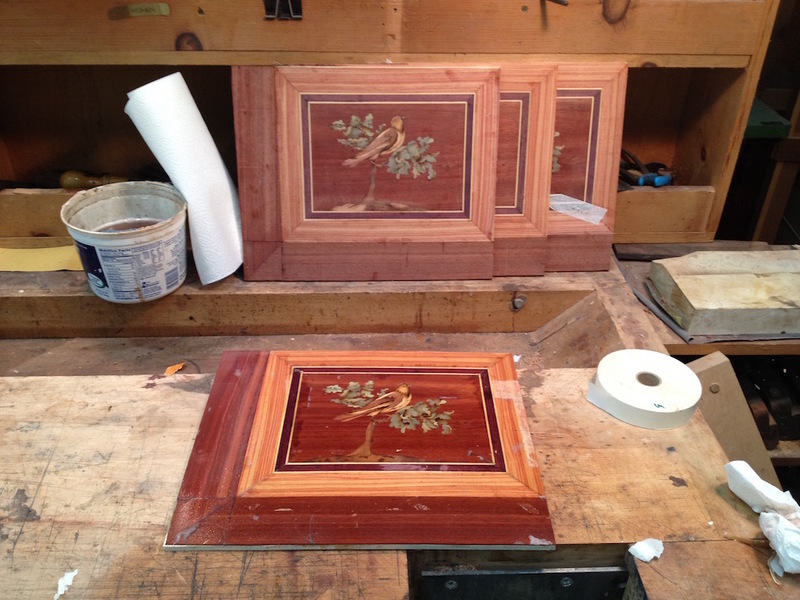 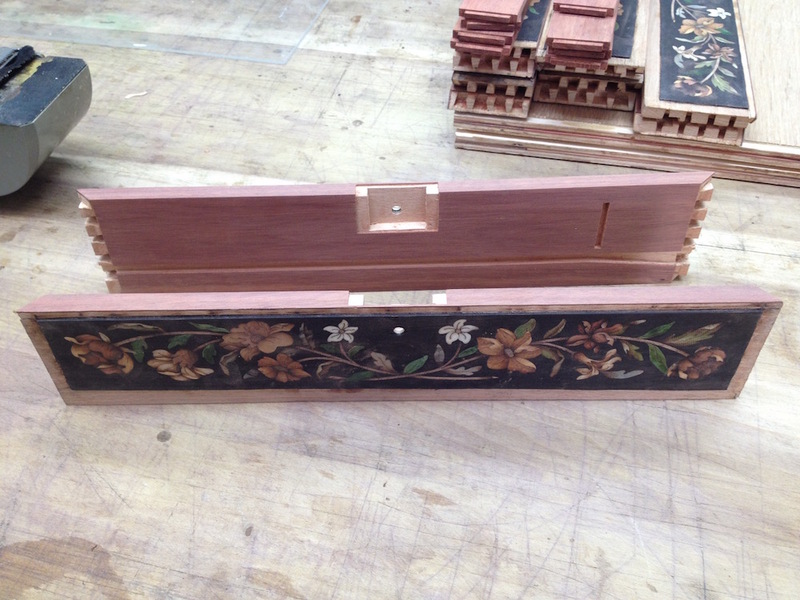 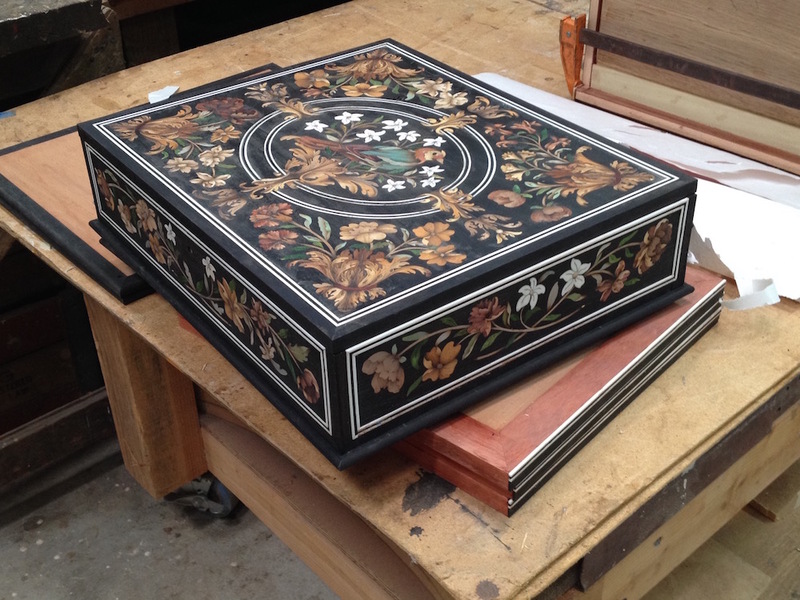 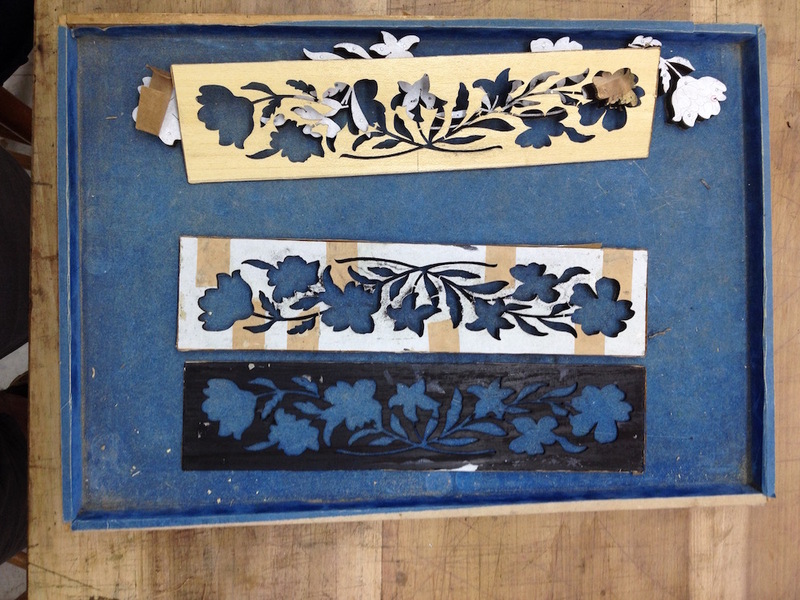 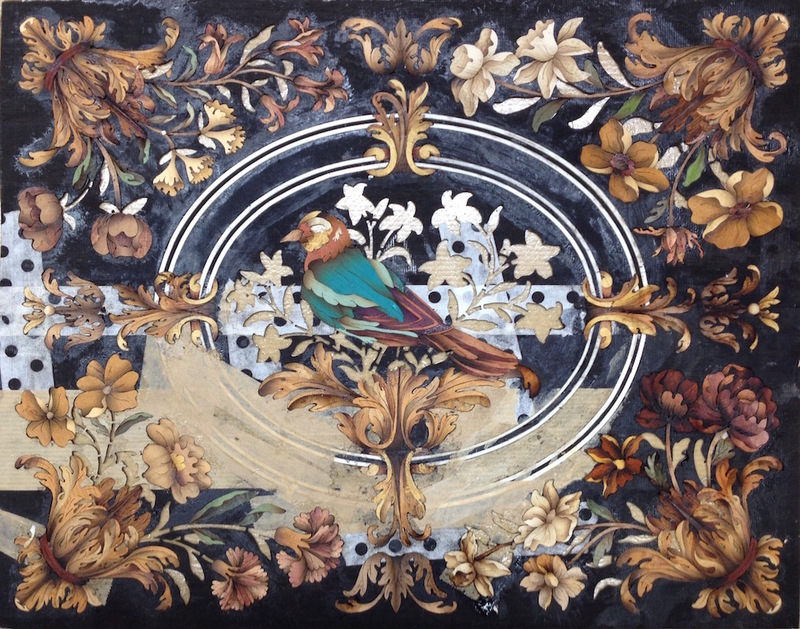 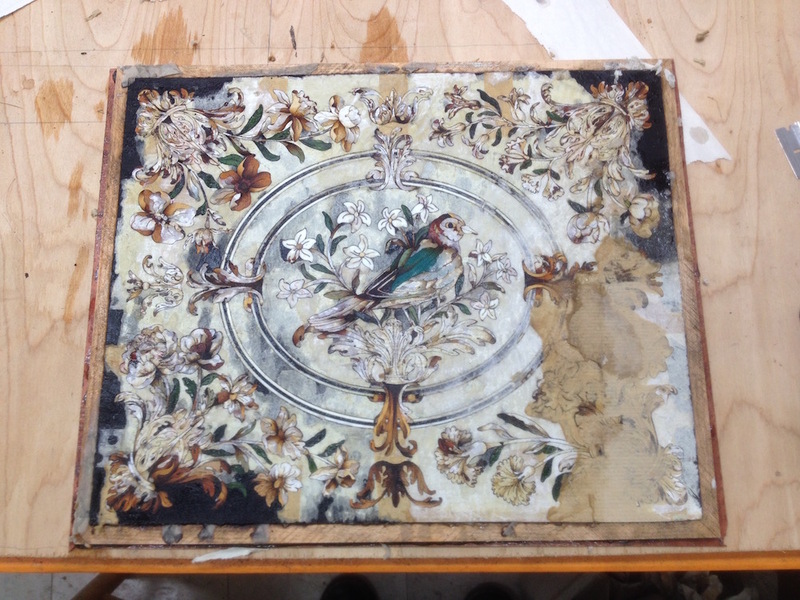 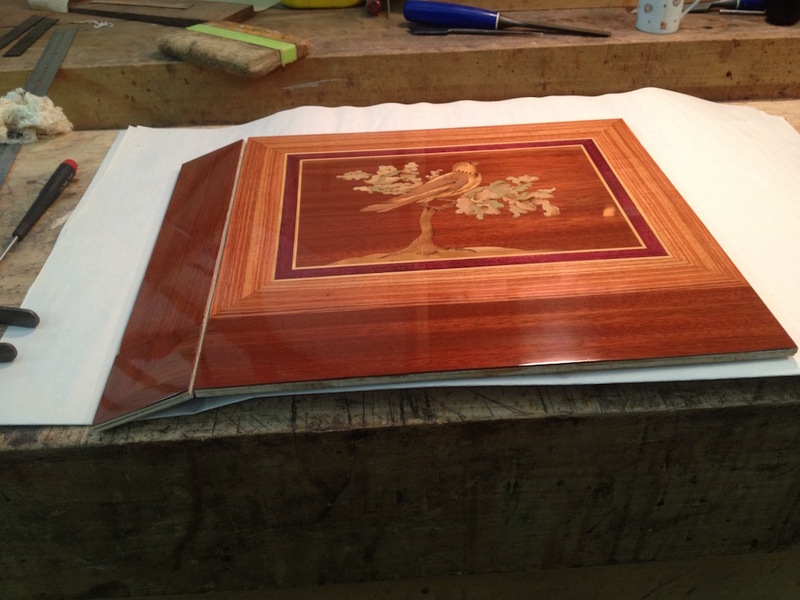 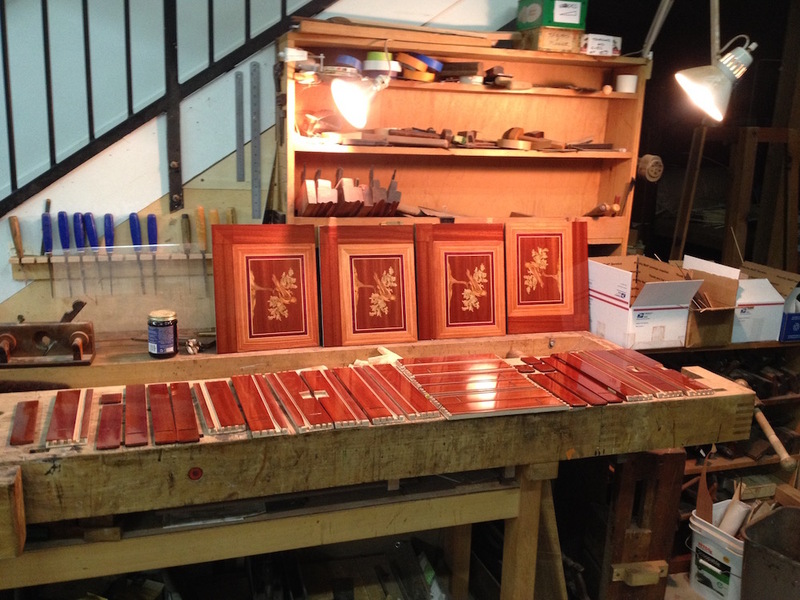 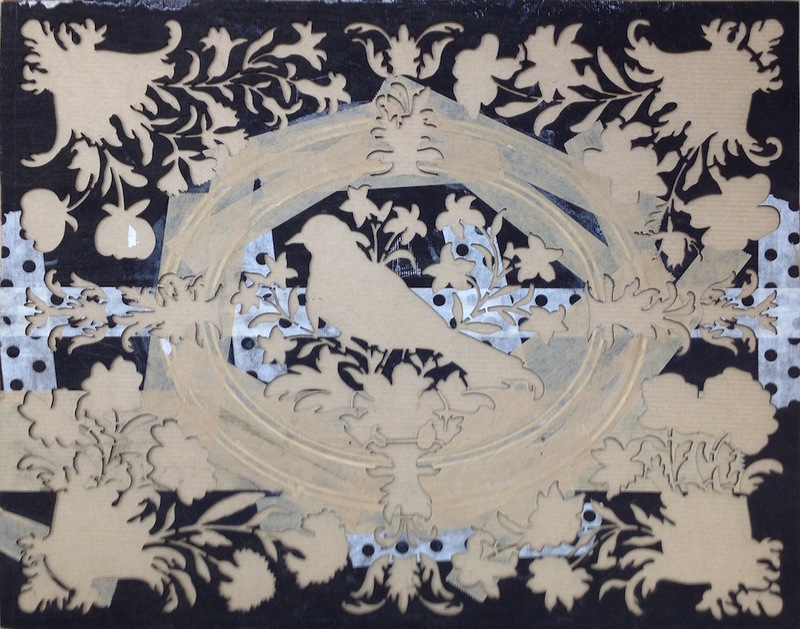 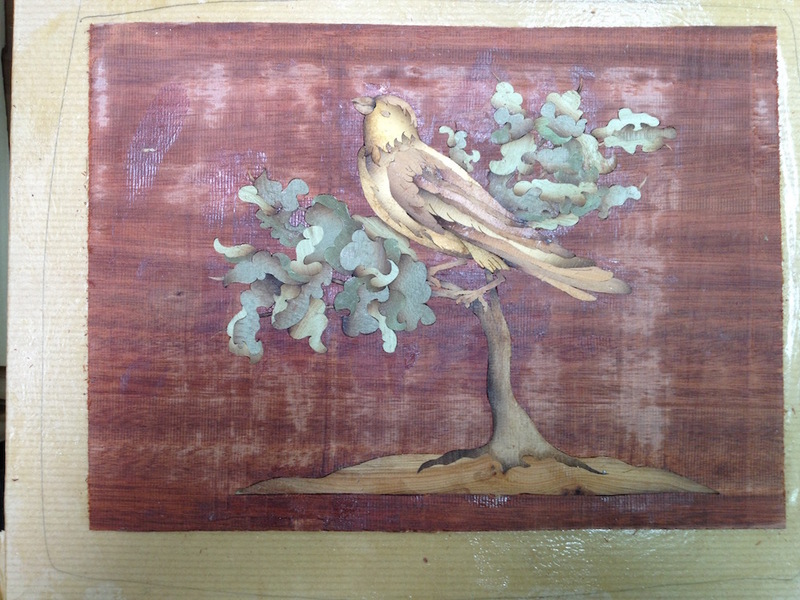 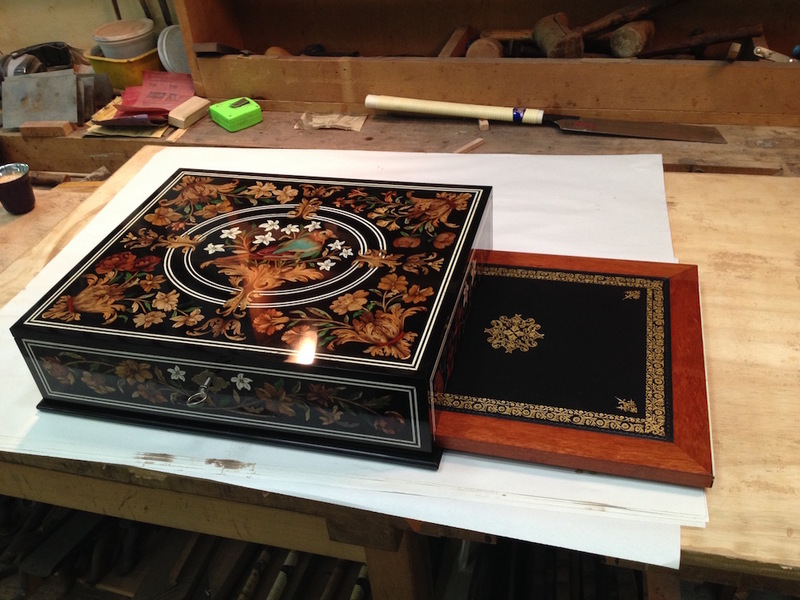 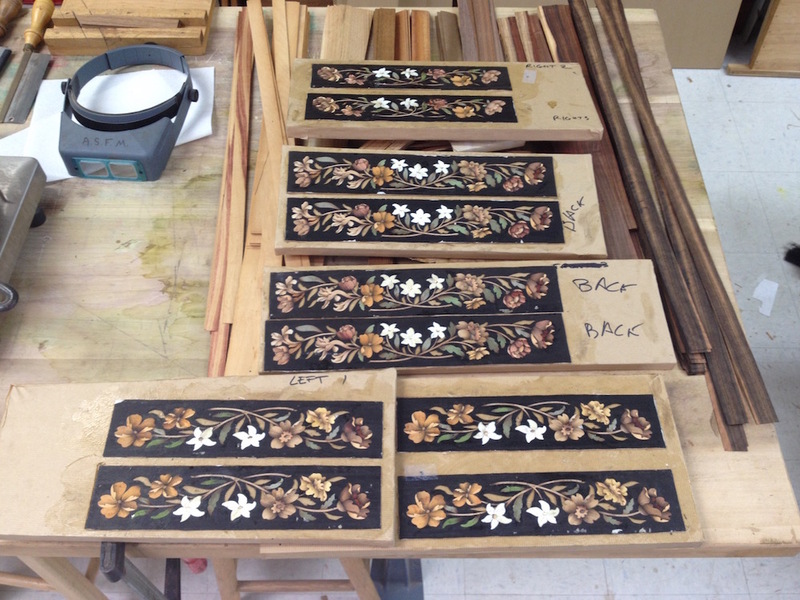 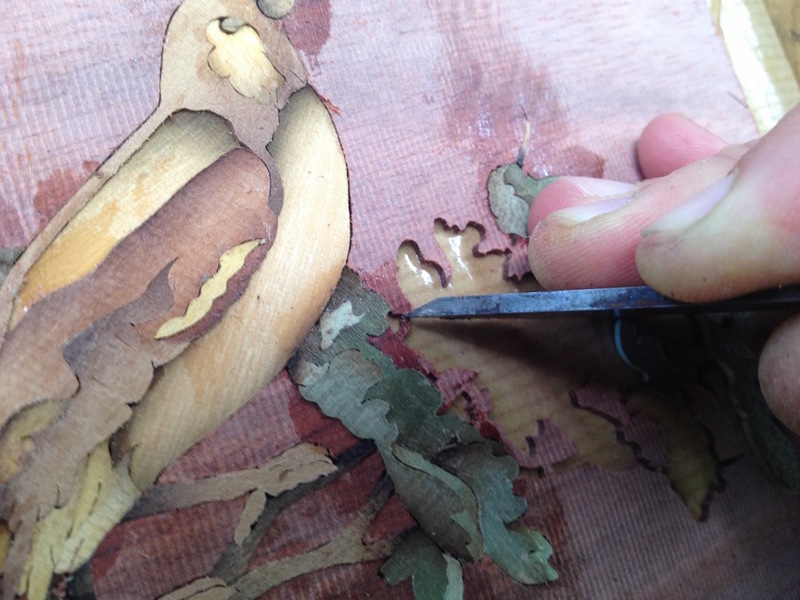 The first marquetry panels to be cut had to be the inside pictures. 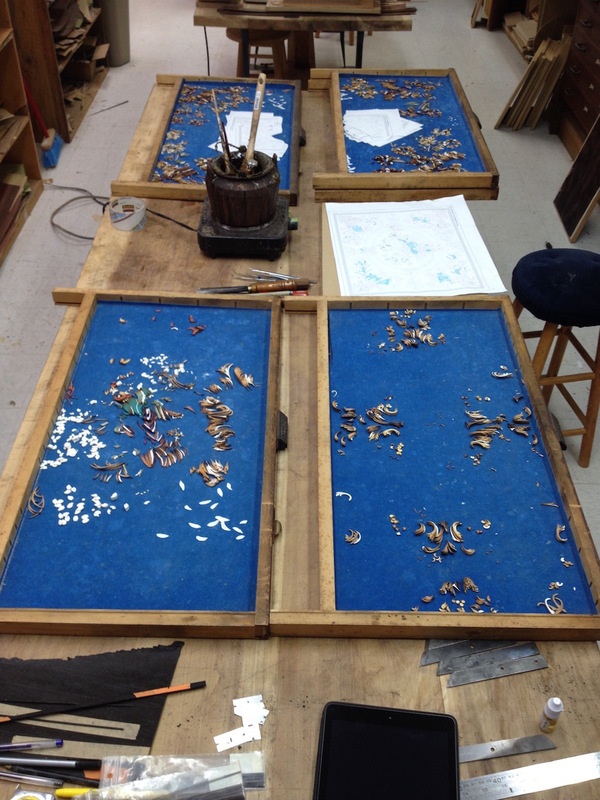 Once the color have been chosen they are numbered on a guide and each piece of pattern is glued accordingly to the packs. 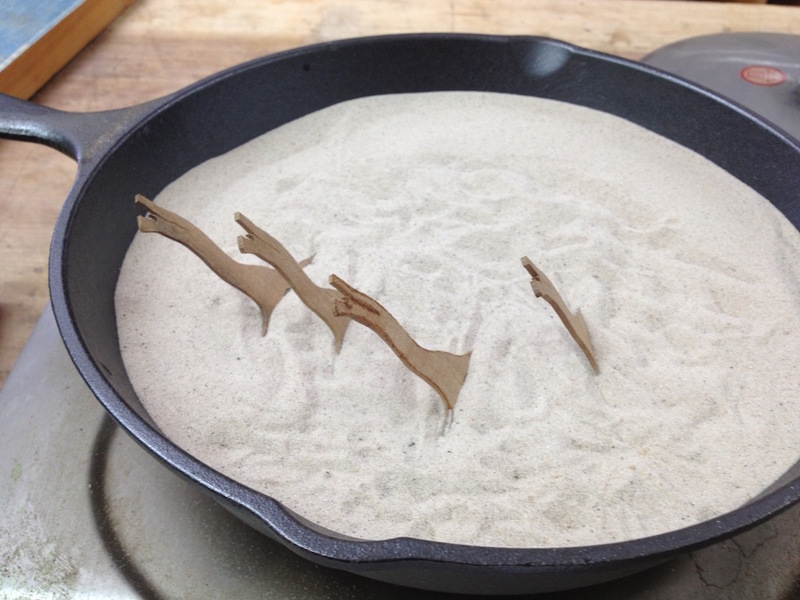 Then they are all shaded in hot sand following a rough guide. 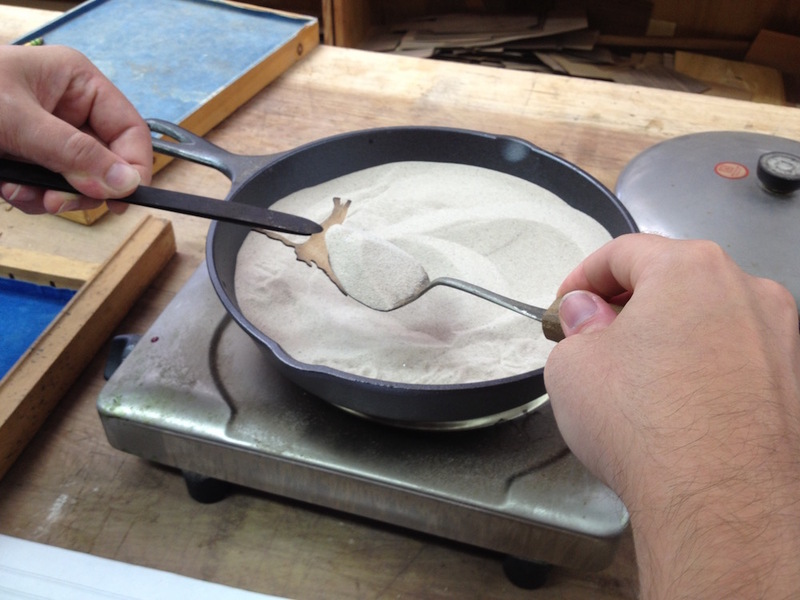 Deeping and spooning are the main techniques used. 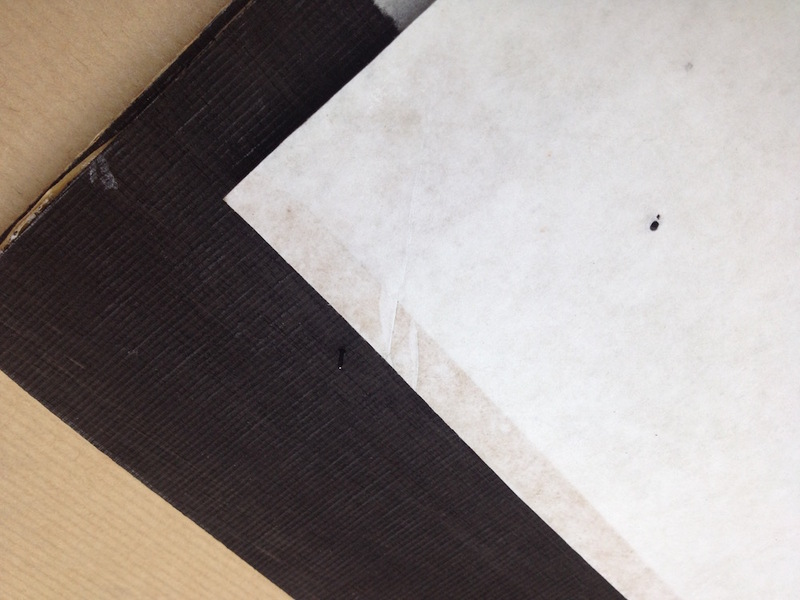 Time to cut the 2 backgrounds. 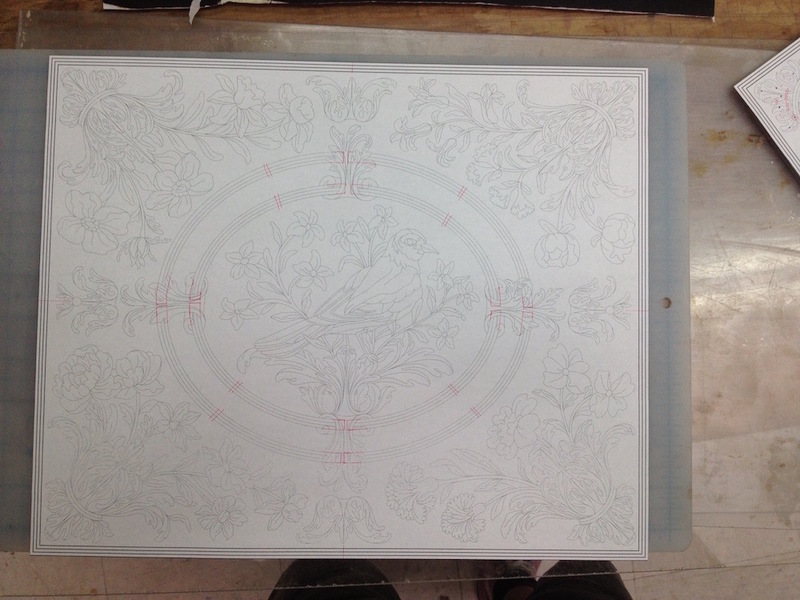 The panels for the inside of the lid will have a more elaborate banding so I cut notches to give me the main lines of cut lines. 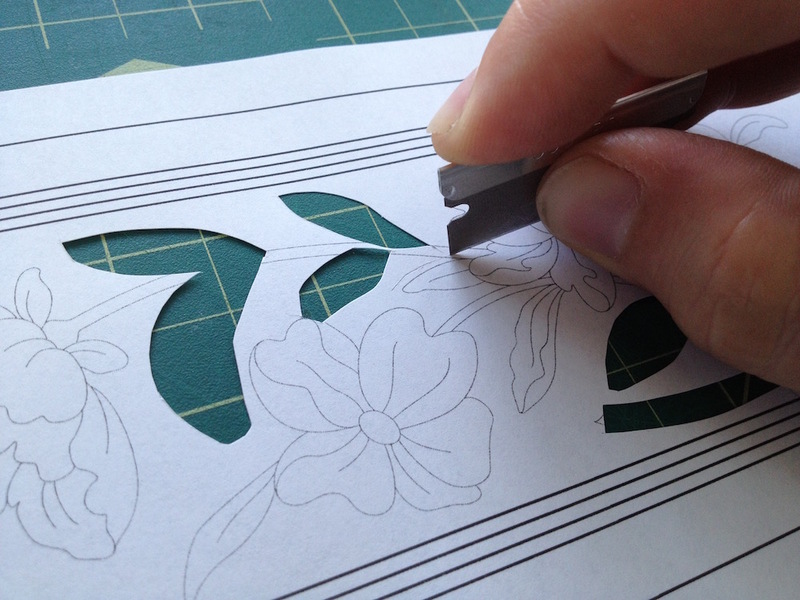 In piece by piece background cutting we use what we call “bridges”. 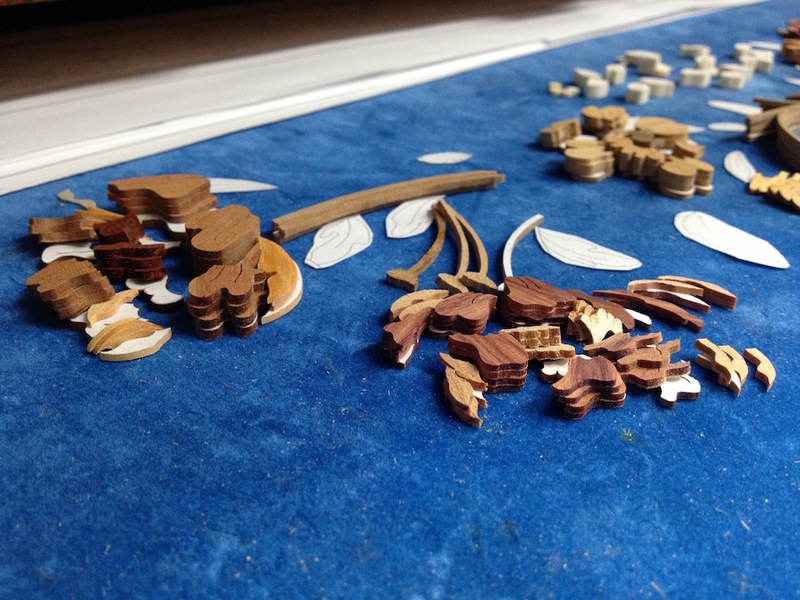 They are small uncut parts that will keep the background islands in place and help you build your panels with more accuracy and less trouble. 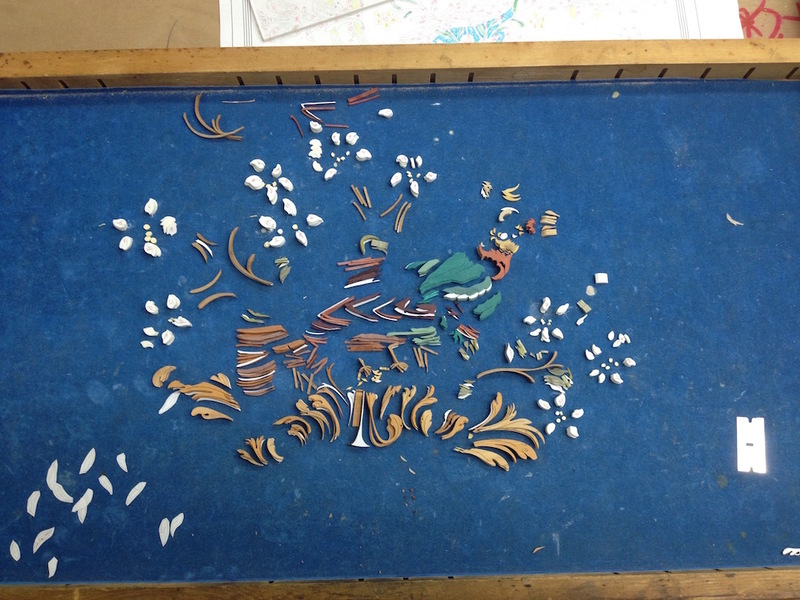 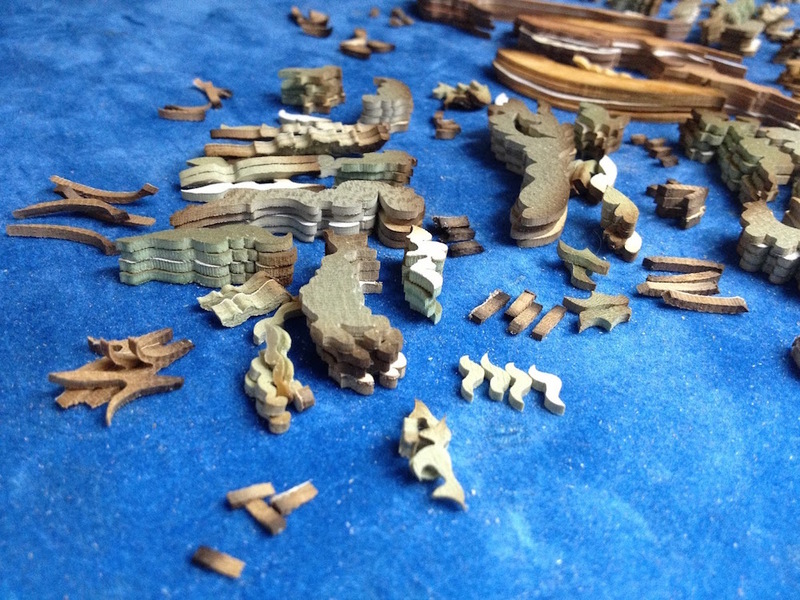 Each piece is numbered with its wood from our list, in yellow the white bone, in green, the green bone and in blue the background islands. 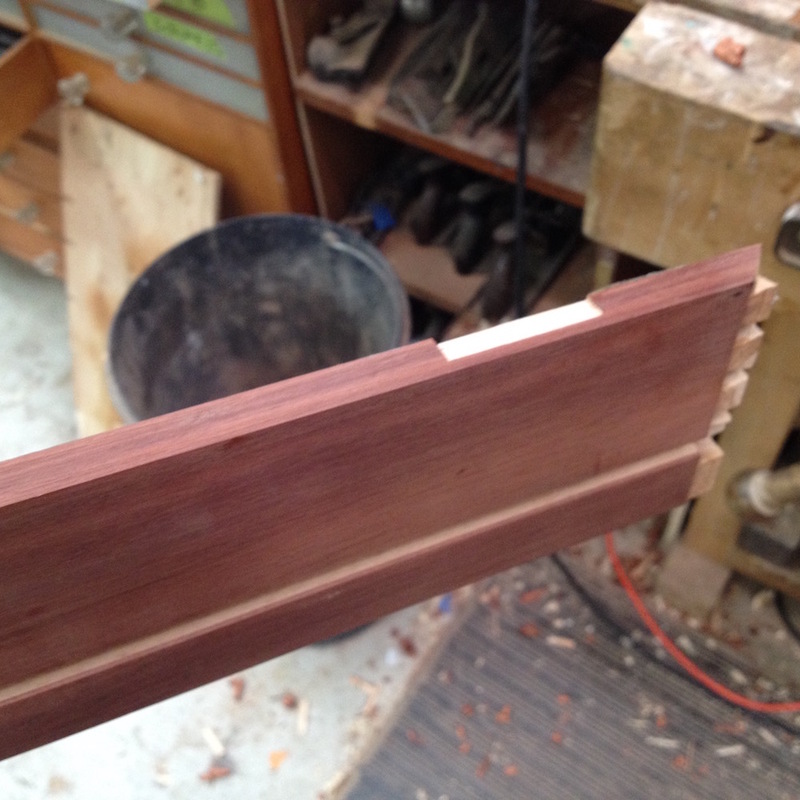 The top has been a bit tricky to figure out. 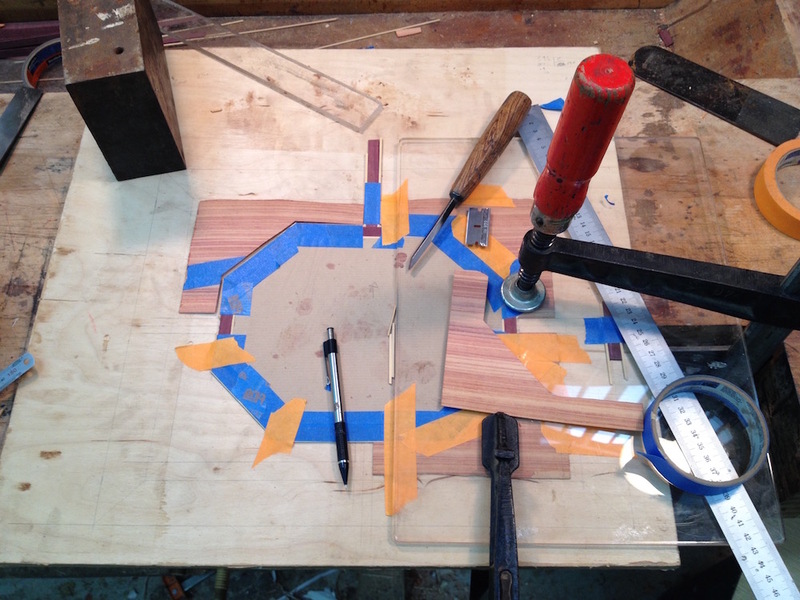 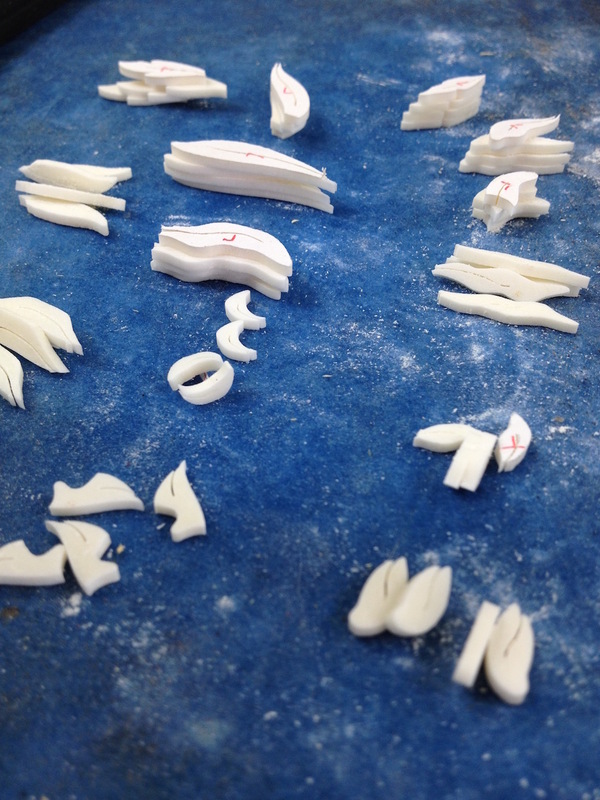 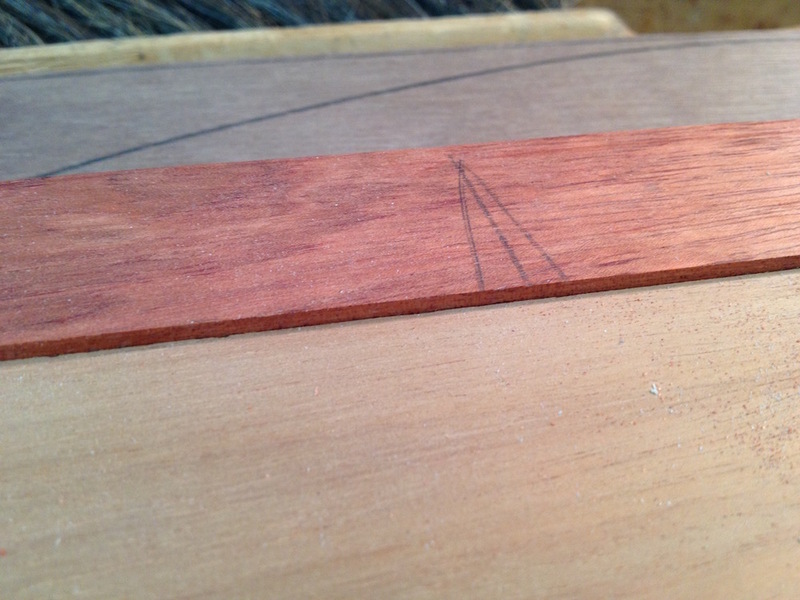 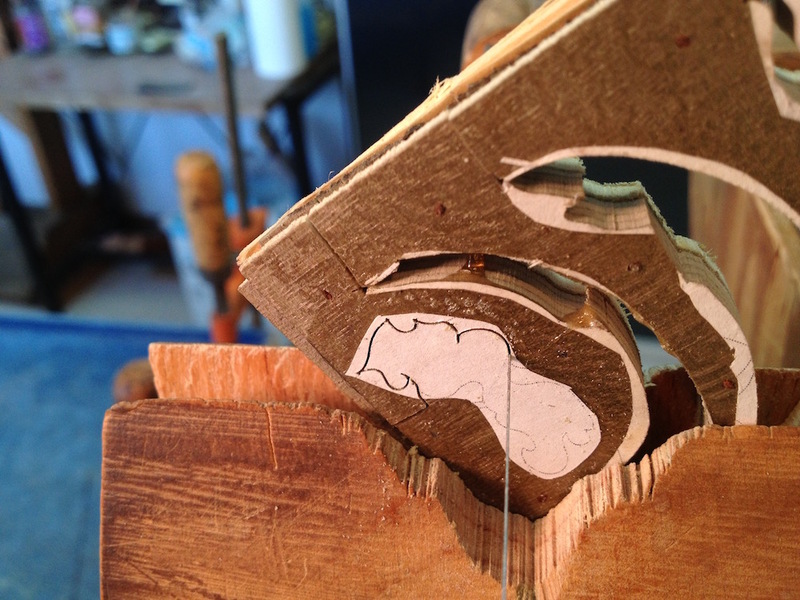 The problem was that I had pieces that looked like wrapping around the bone inlay oval. 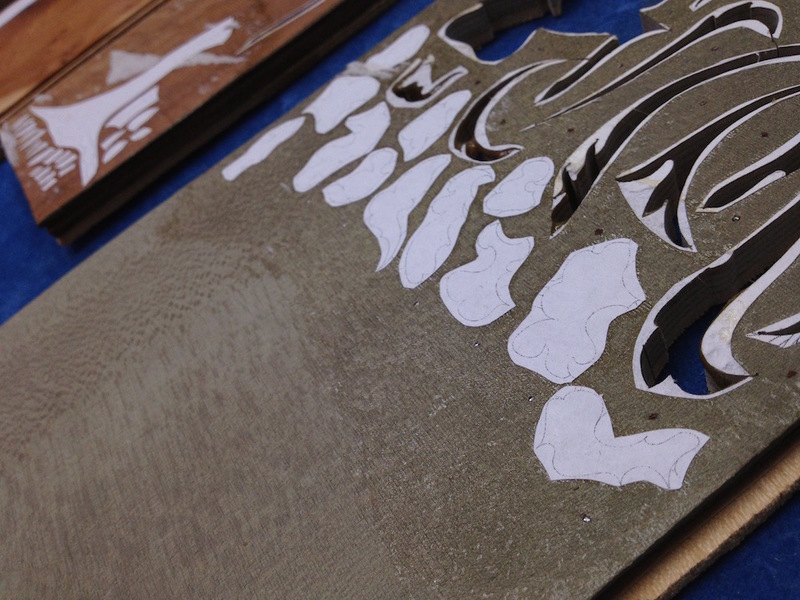 So I decided to cut the background in 2 steps, first the bone inlay, then rebuild the pack and finally cut the background. 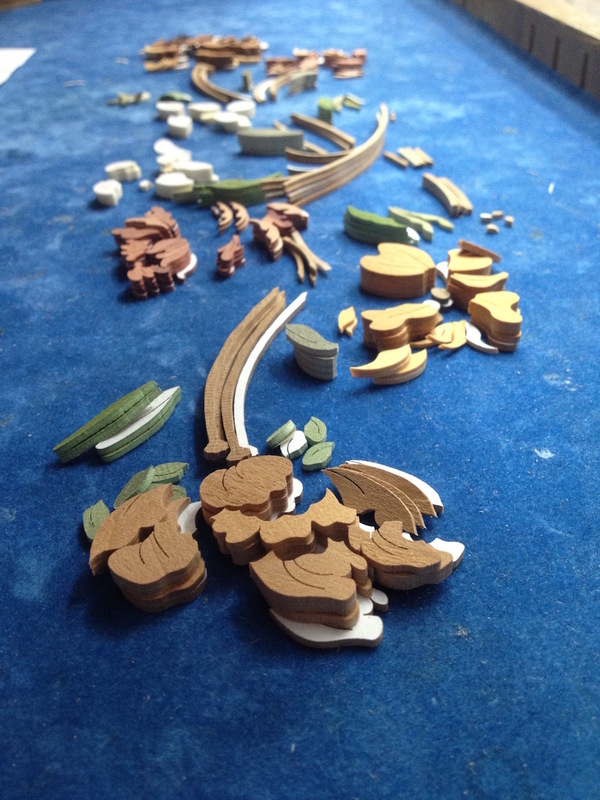 To do so, I needed a way to rebuild the pack exactly and realign perfectly the second design in order to have my bone inlays at the right place as good as possible. 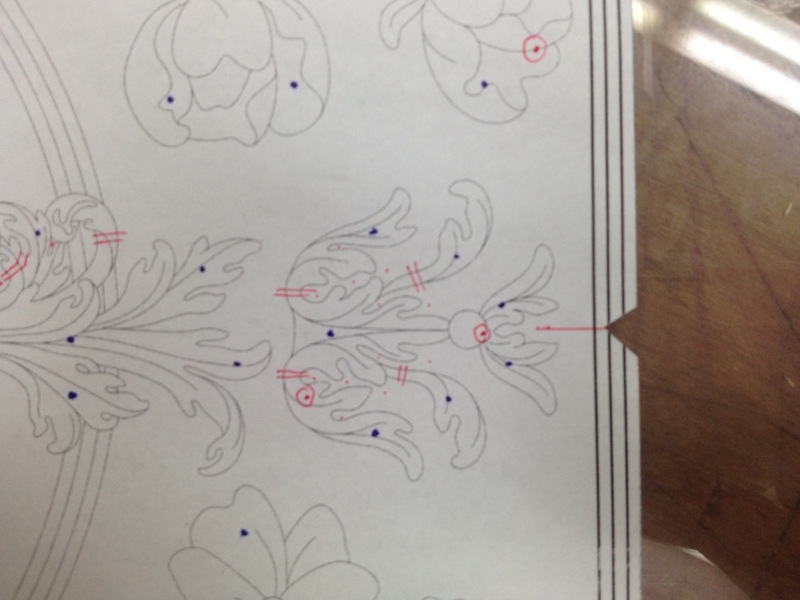 Do the same line on the next drawing but with notches, align is as good as possible, clamp it on the first pack and drill a small hole in the 4 corners, in what will be waste. 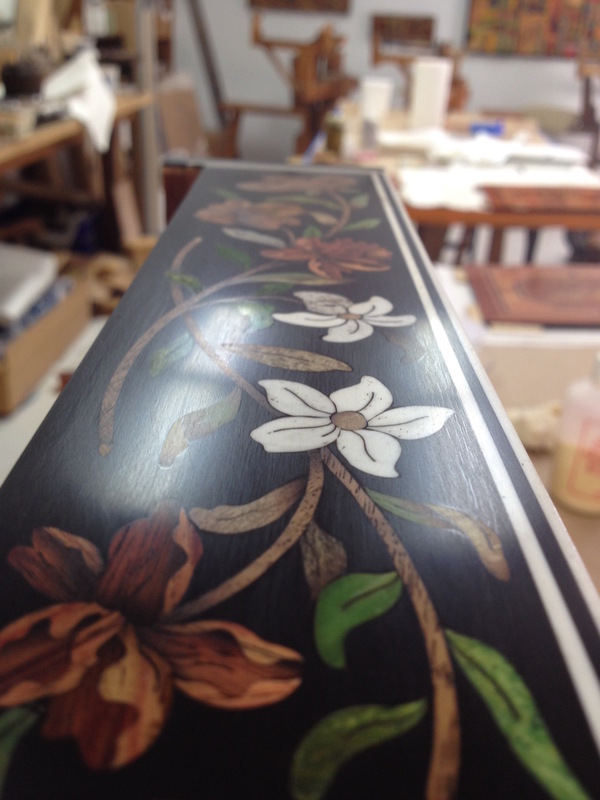 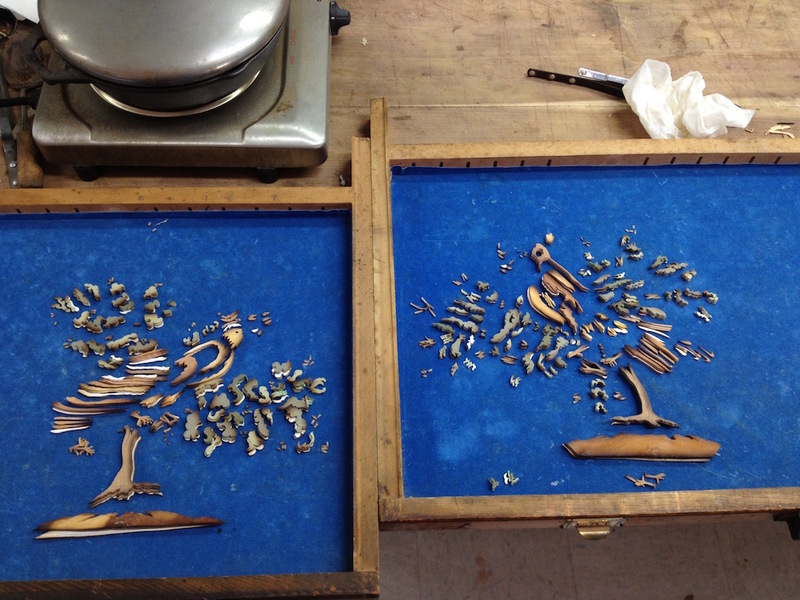 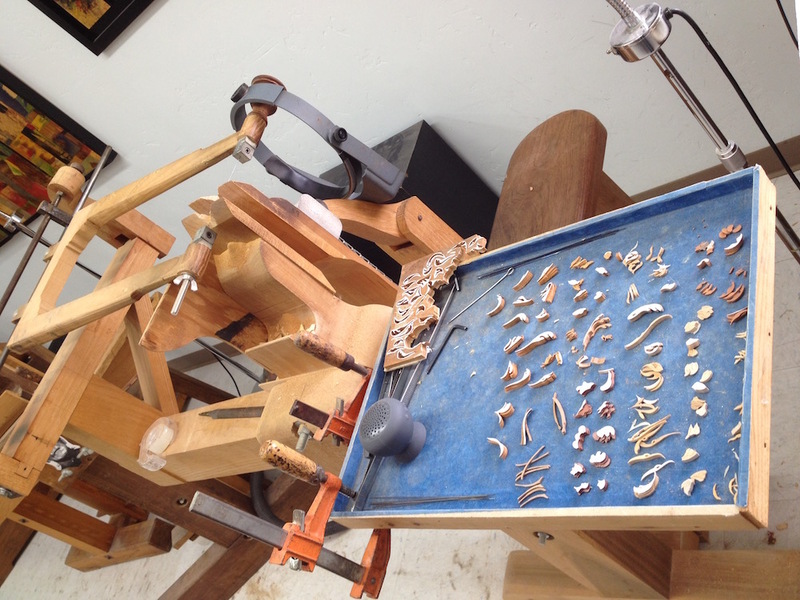 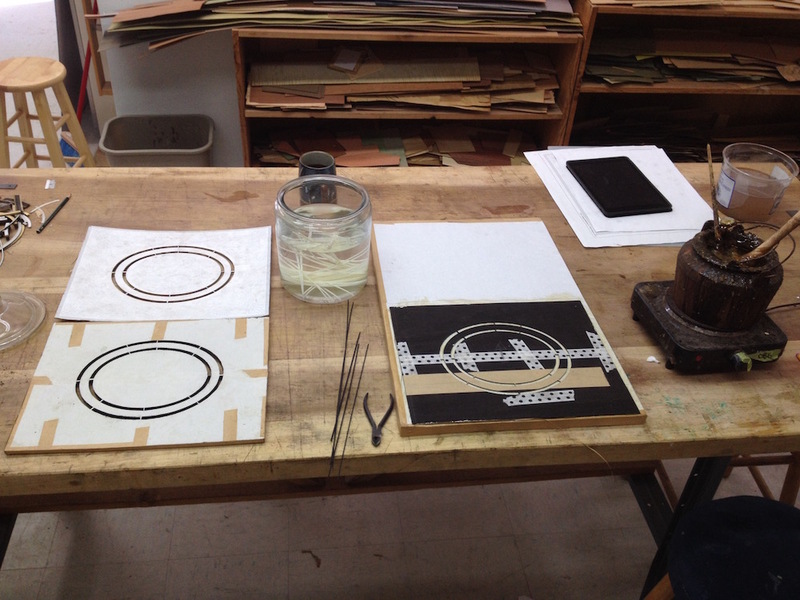 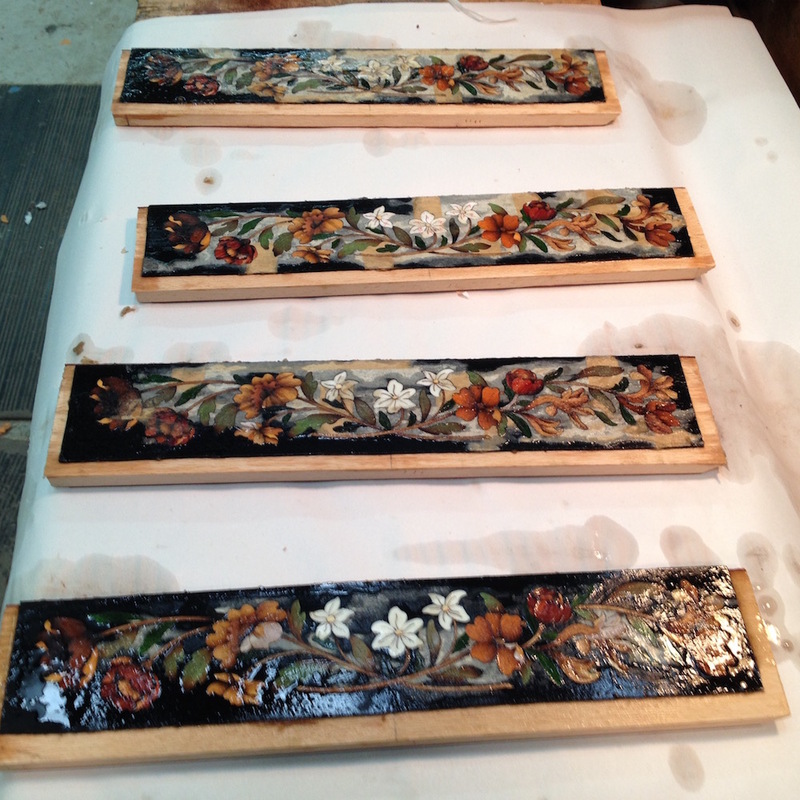 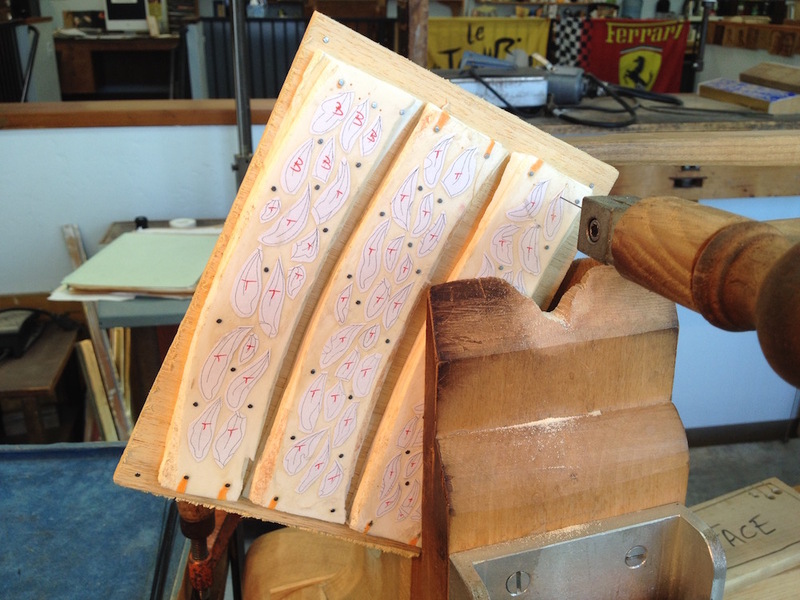 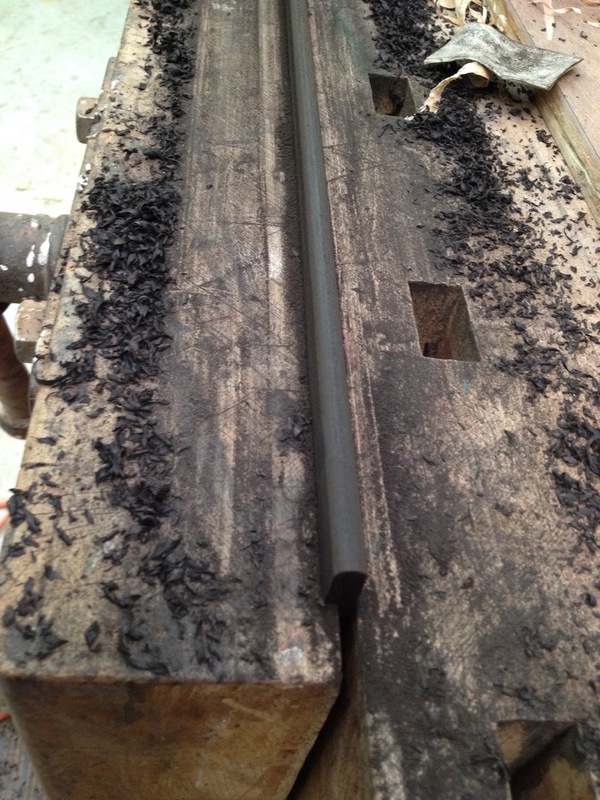 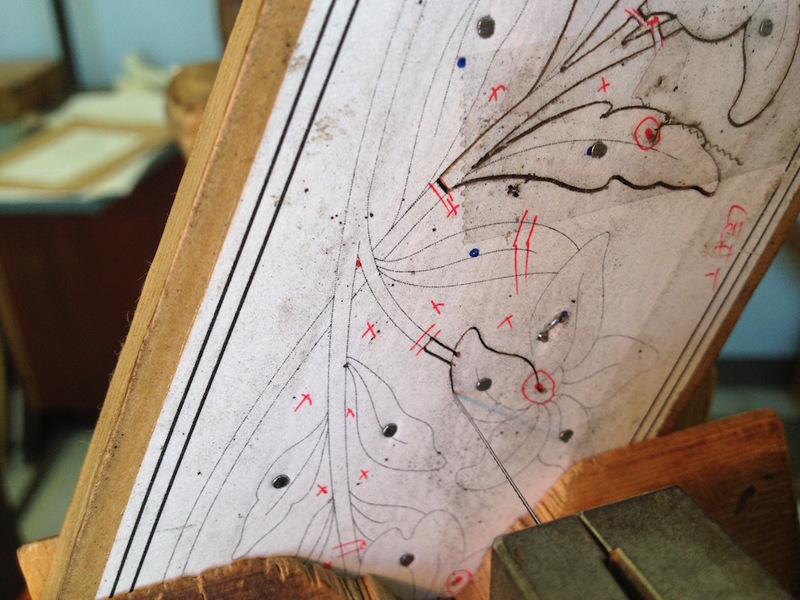 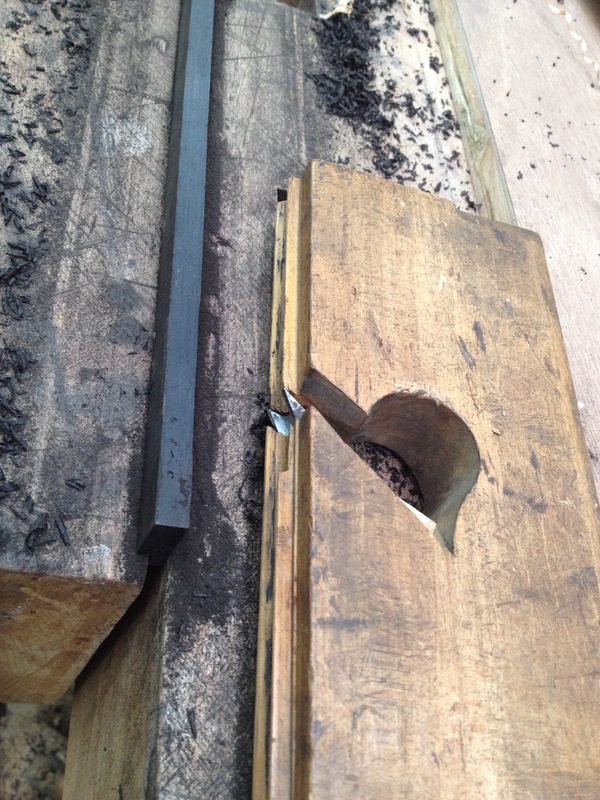 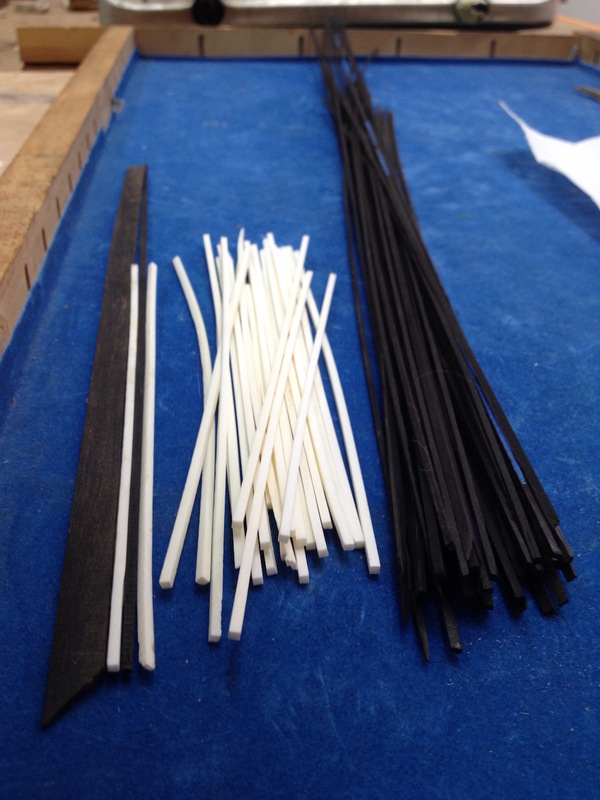 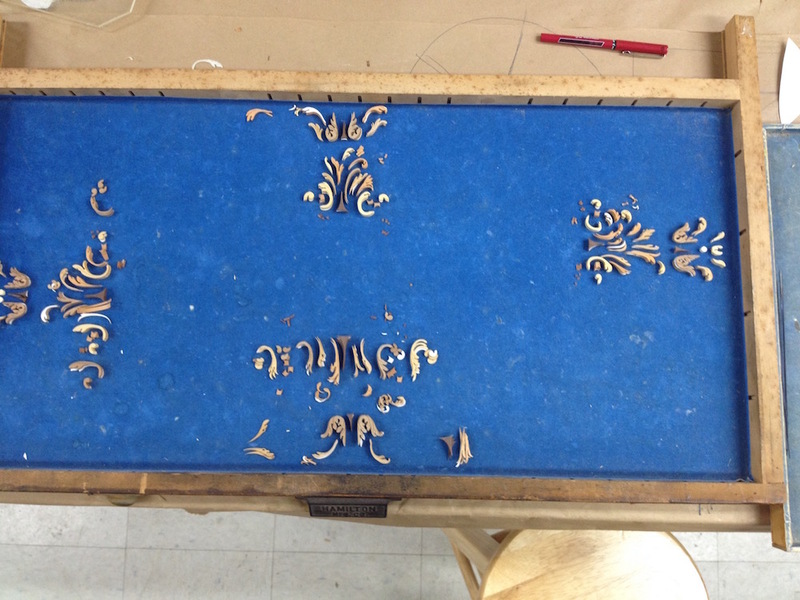 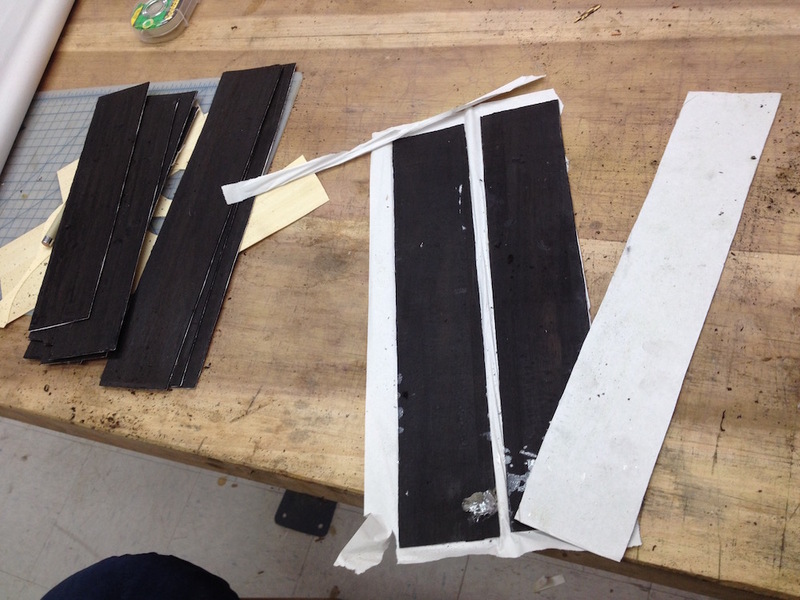 The bone purflings previously soaked and ebony inlay were then installed on a light paper assembly board. 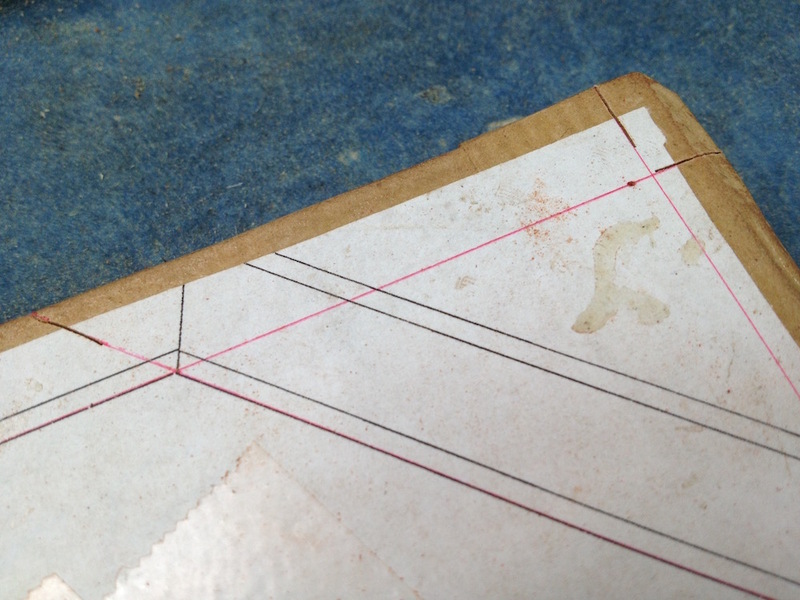 The pack was then rebuild using the small hole to realign the inside parts and the second drawing as close to perfect as possible using veneer nails. 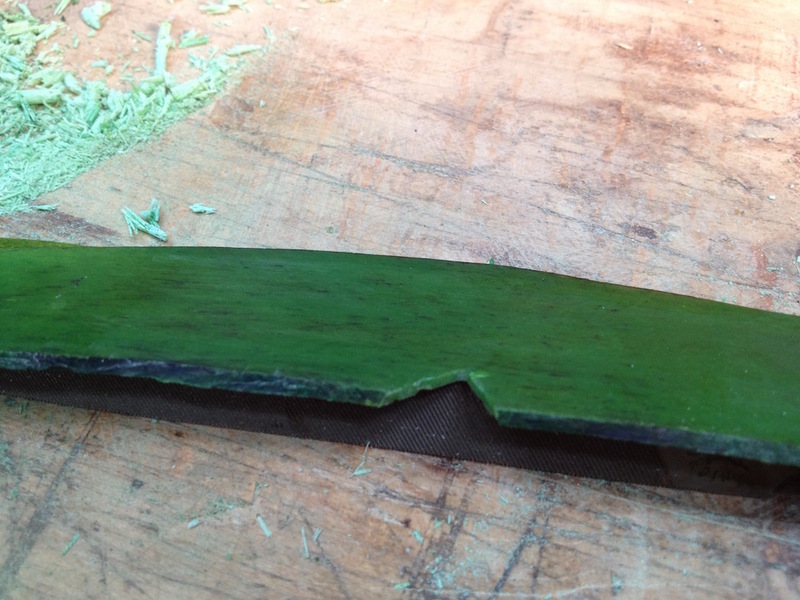 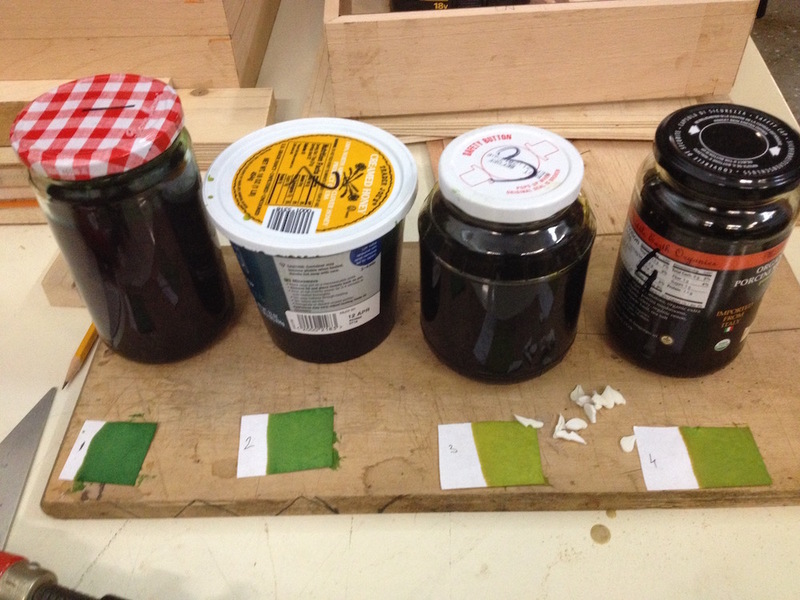 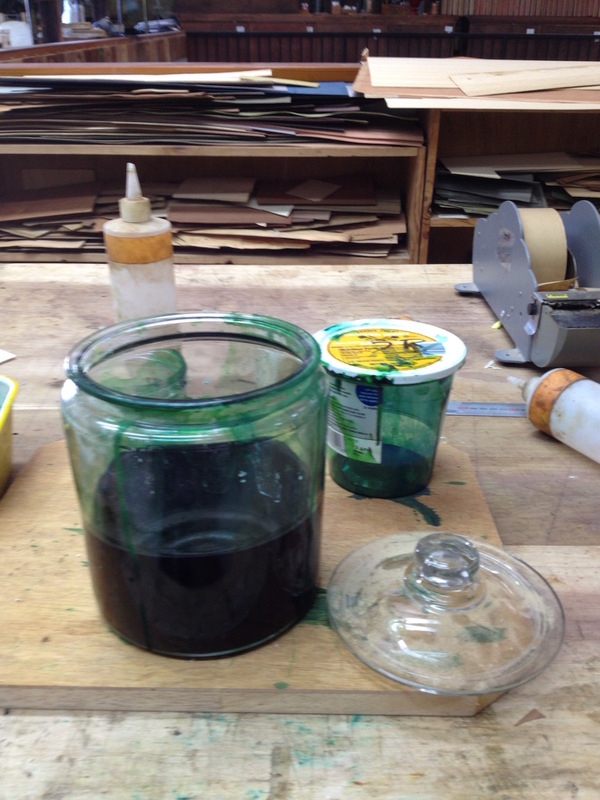 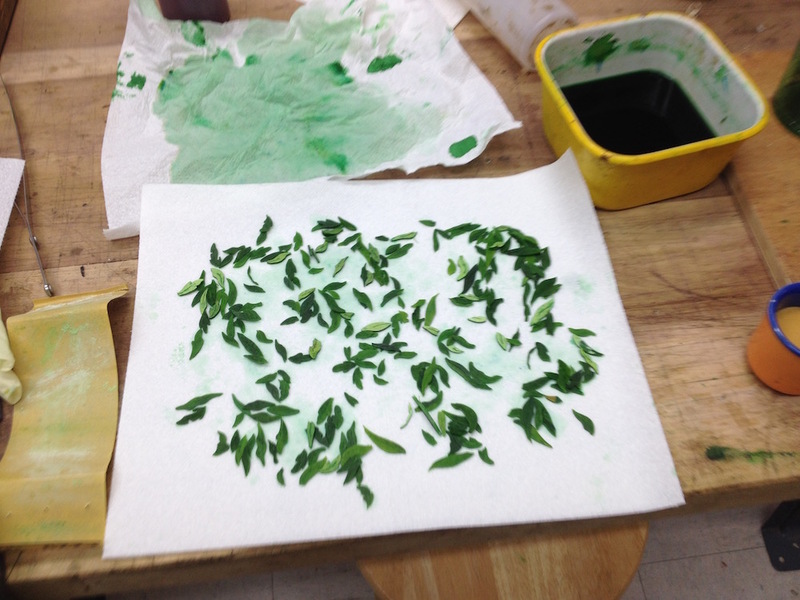 This our test to dye the bone green, finding a pleasant color. 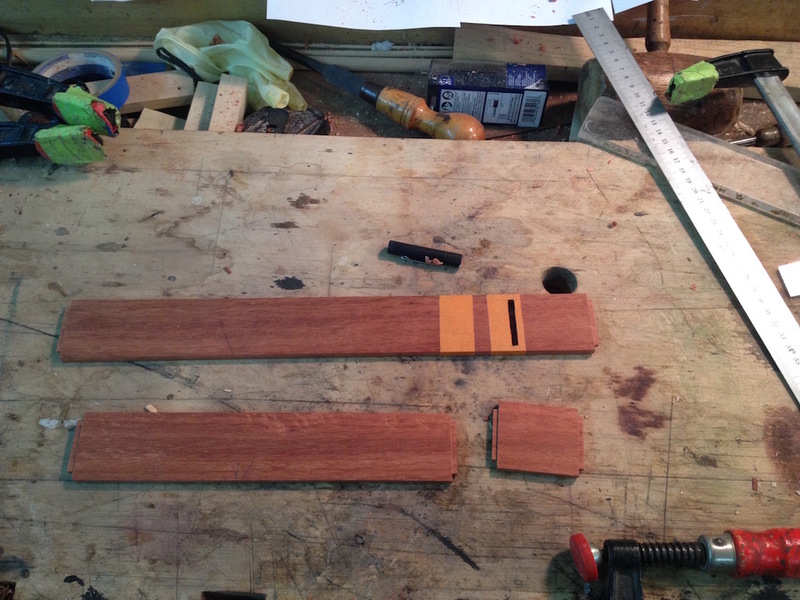 They need to be dyed all the way through to keep color through sanding. 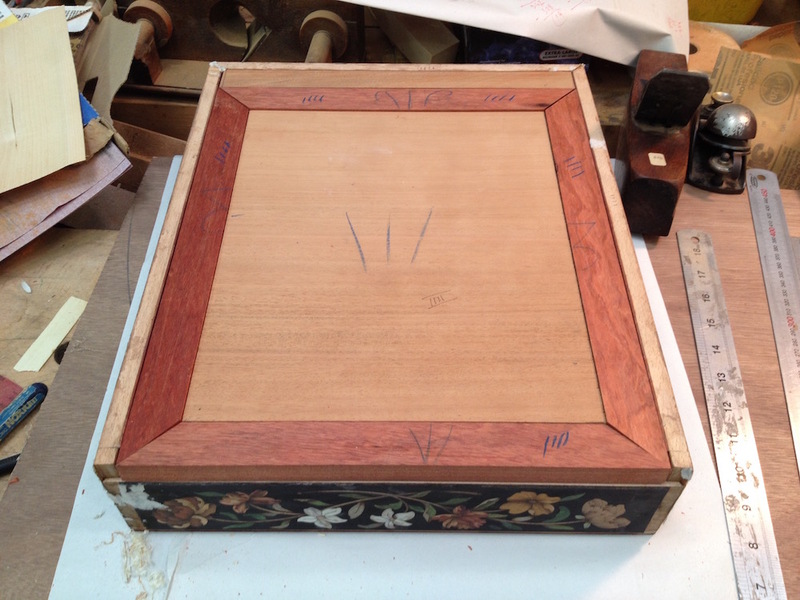 The sides are glued to the box. 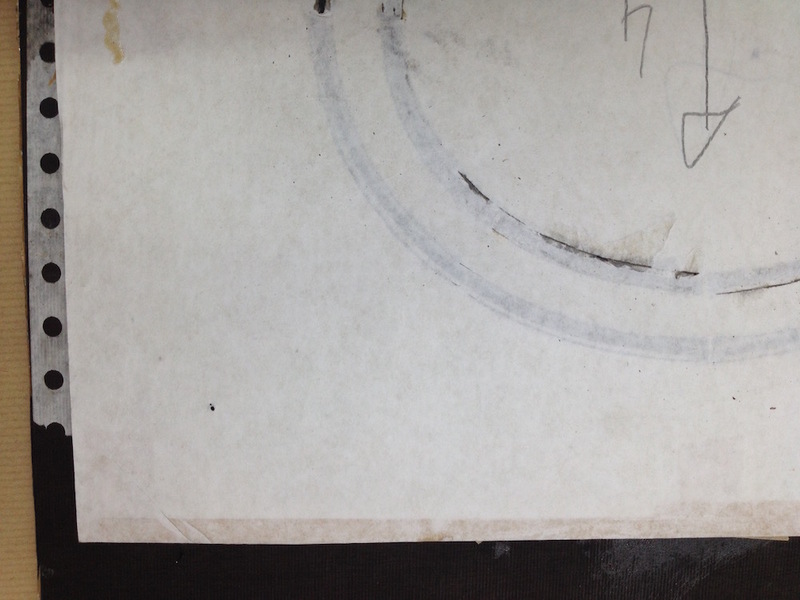 The paper on the face can then be taken of with cold water. 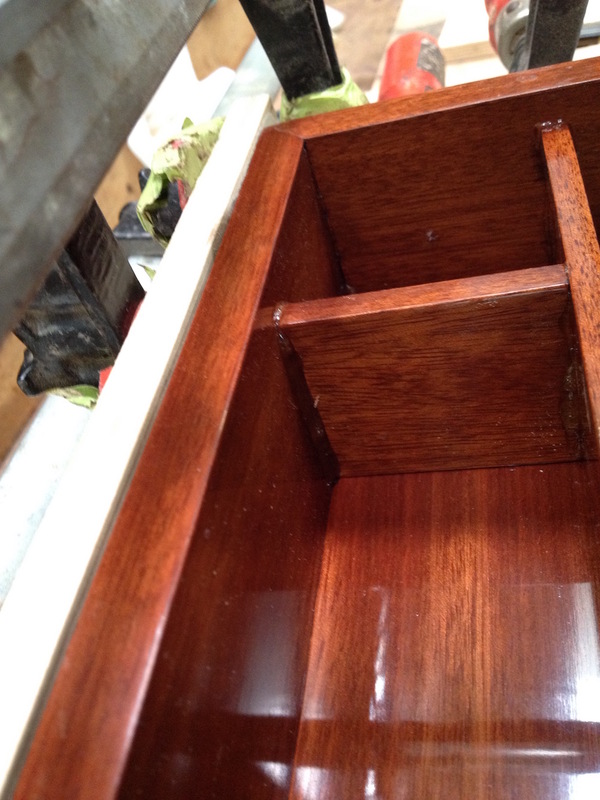 The inside of the box needs to be polished before glueing, as it is impossible to do nice french polish corners otherwise. 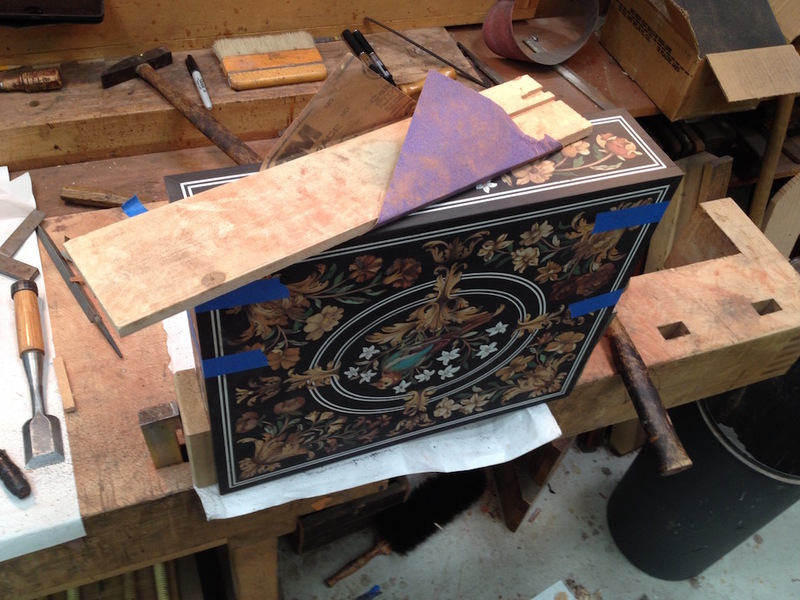 The box is glued using the Liquid Hide Glue Old Brown Glue. 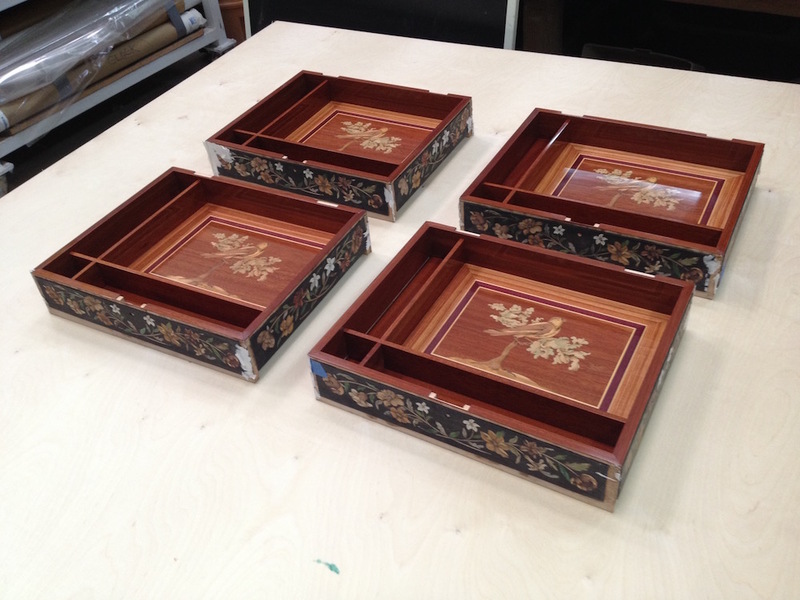 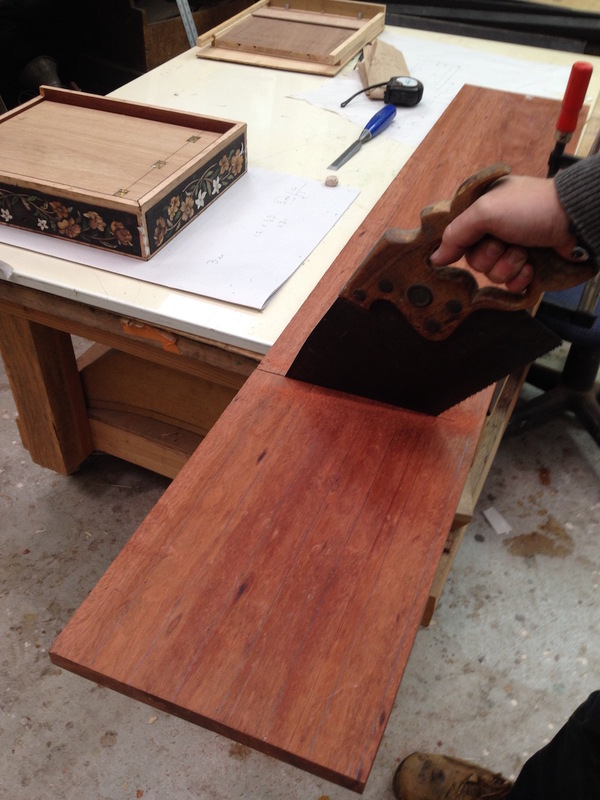 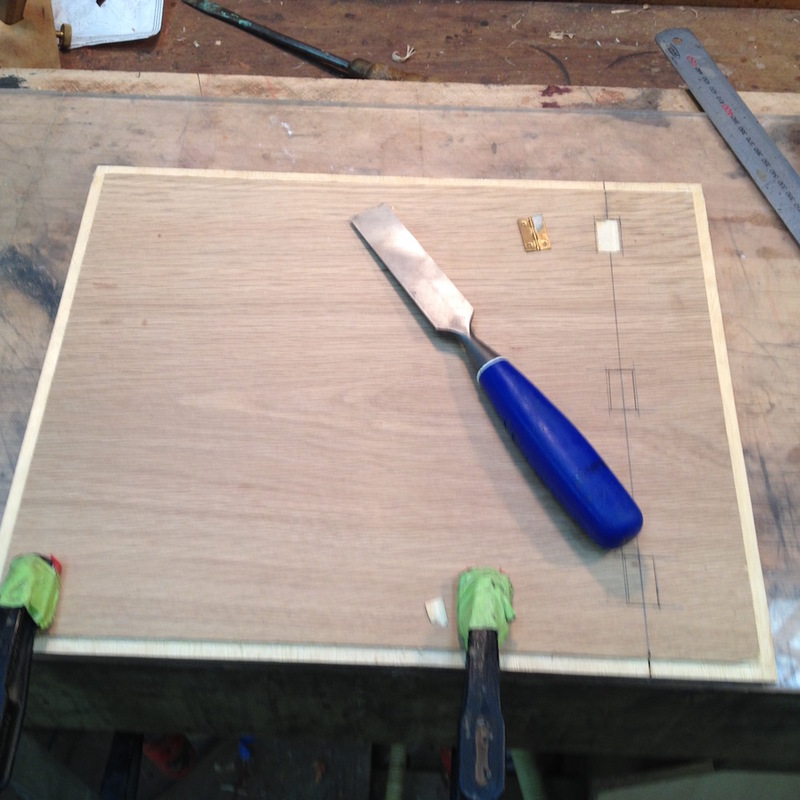 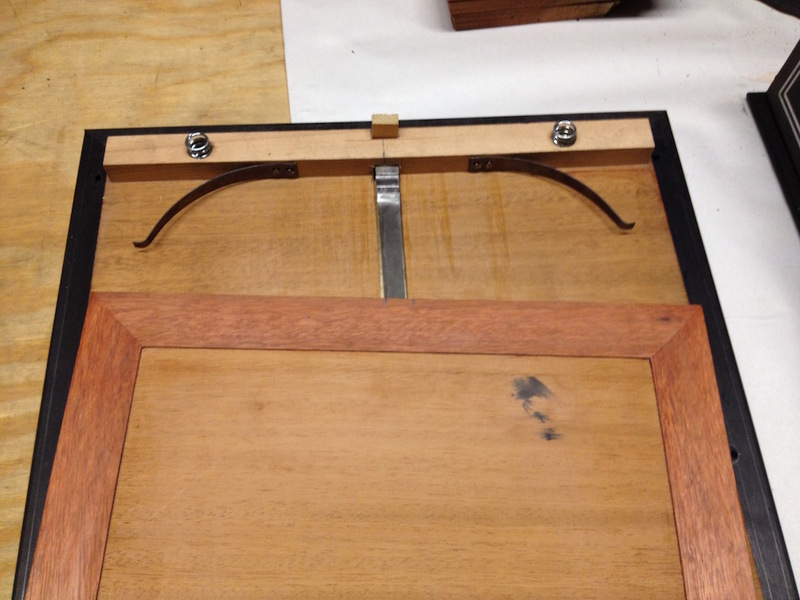 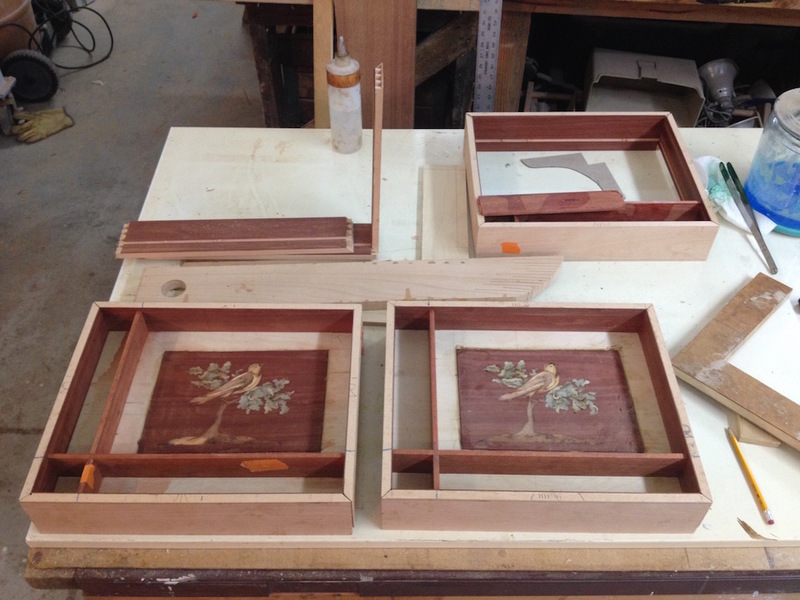 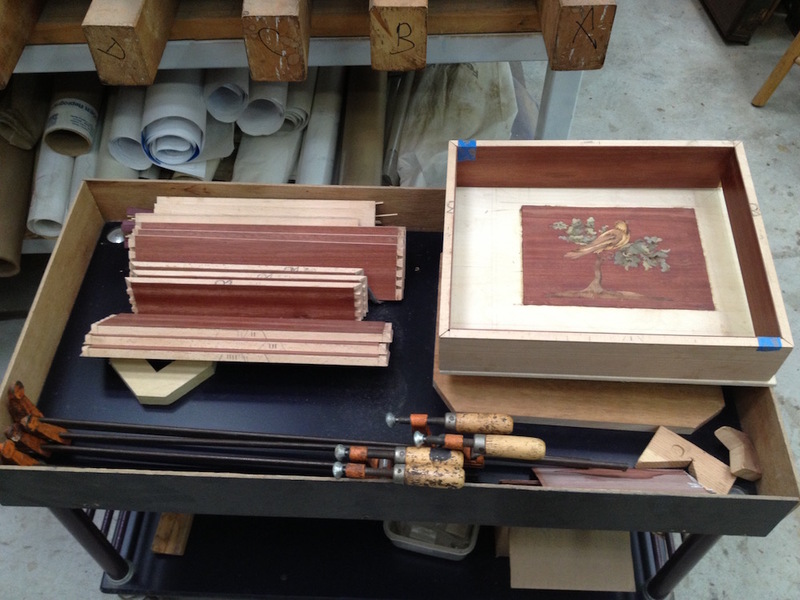 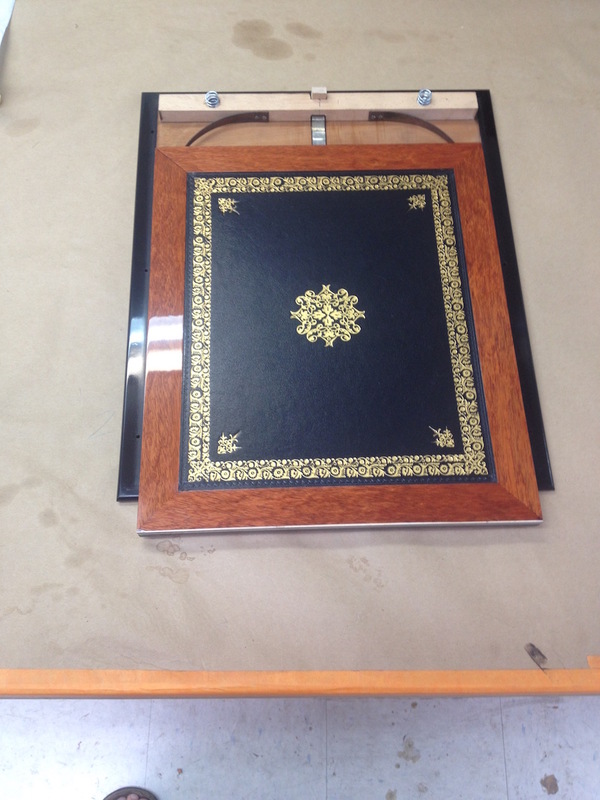 Now that we have 4 glued boxes we can make the bloodwood secret trays to fit. 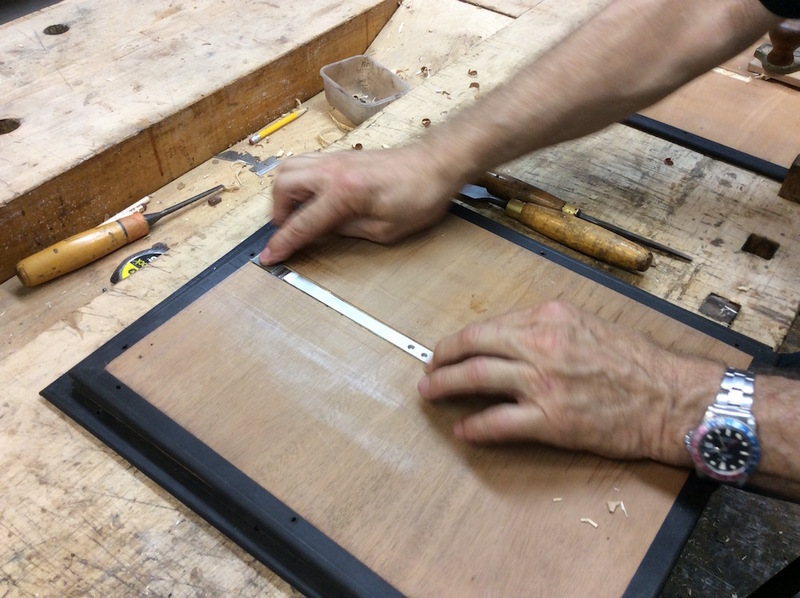 The tray has a 2mm recess to install a leather. 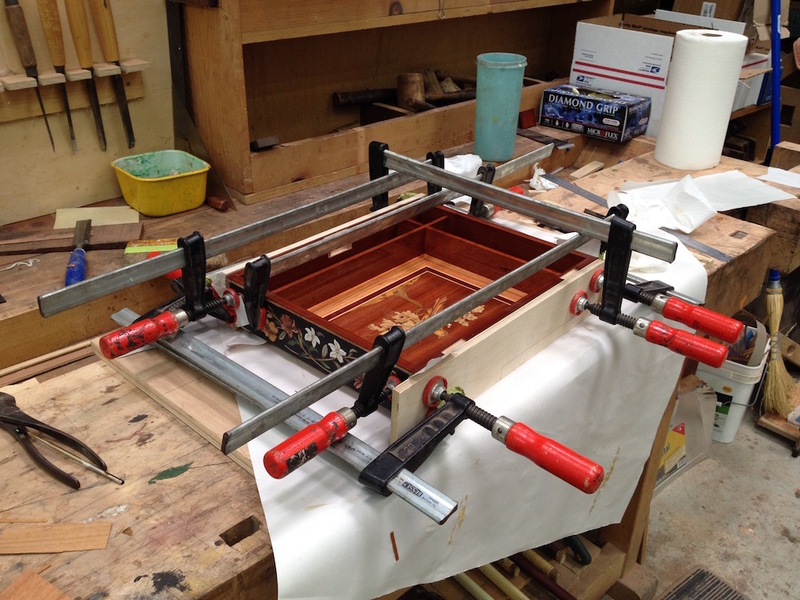 It is also time to build the base on which the box will be screwed on, the mechanism will be installed and the tray will slide on. 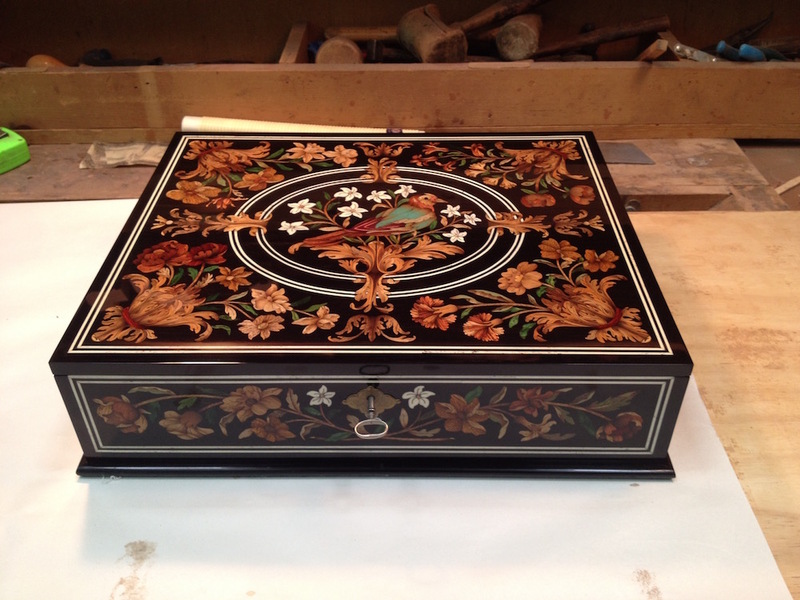 Time to get busy on the lid. 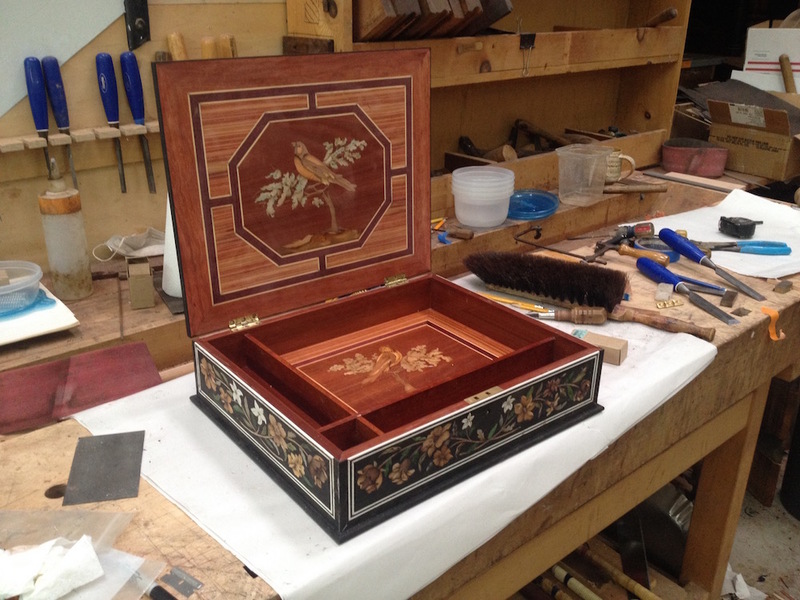 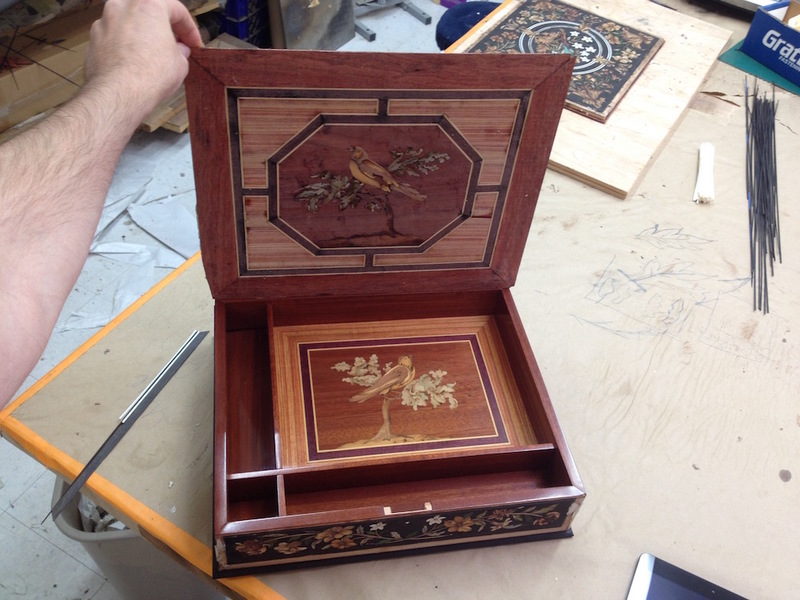 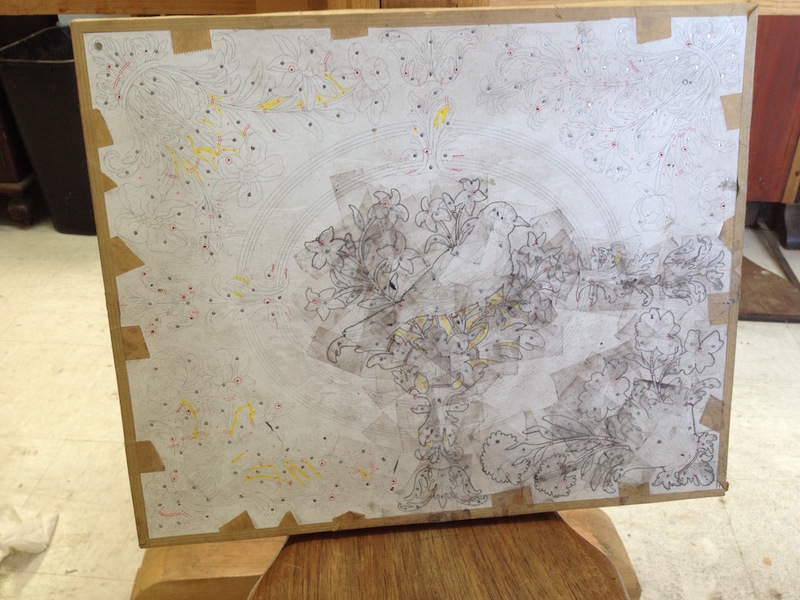 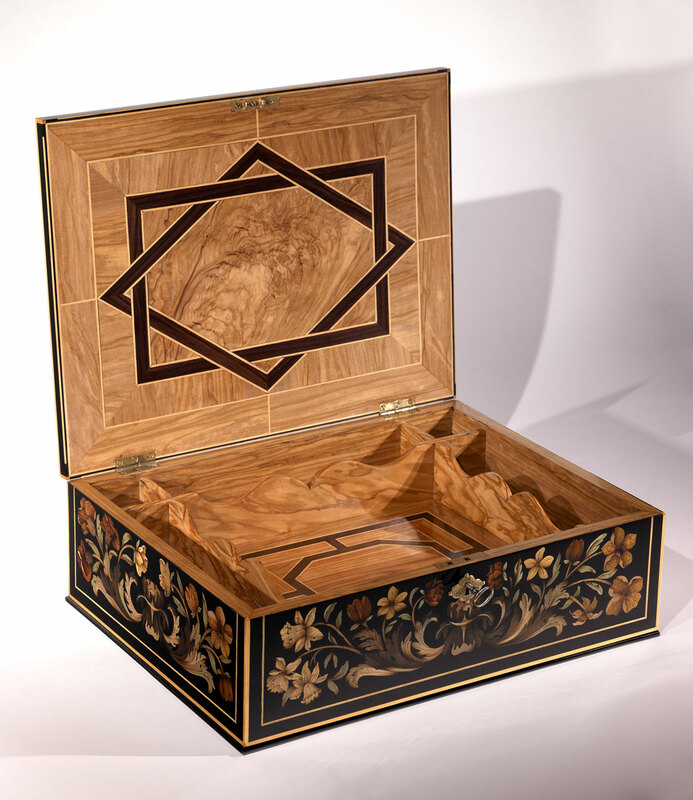 The inside picture is build using the marquetry panels prepared couple months ago and kept on paper. 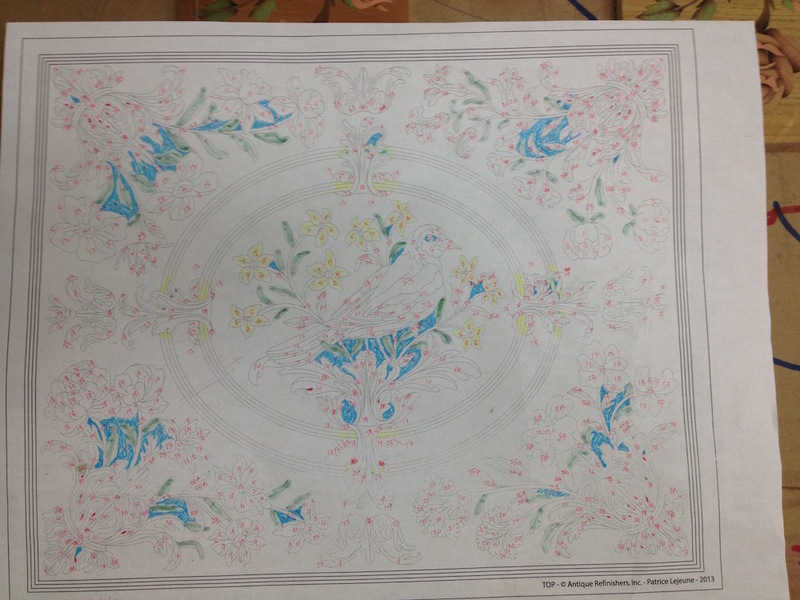 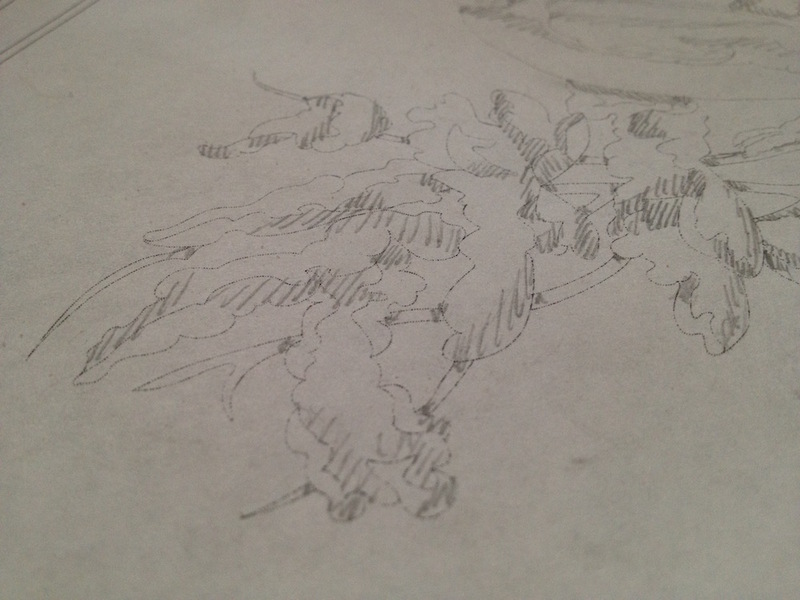 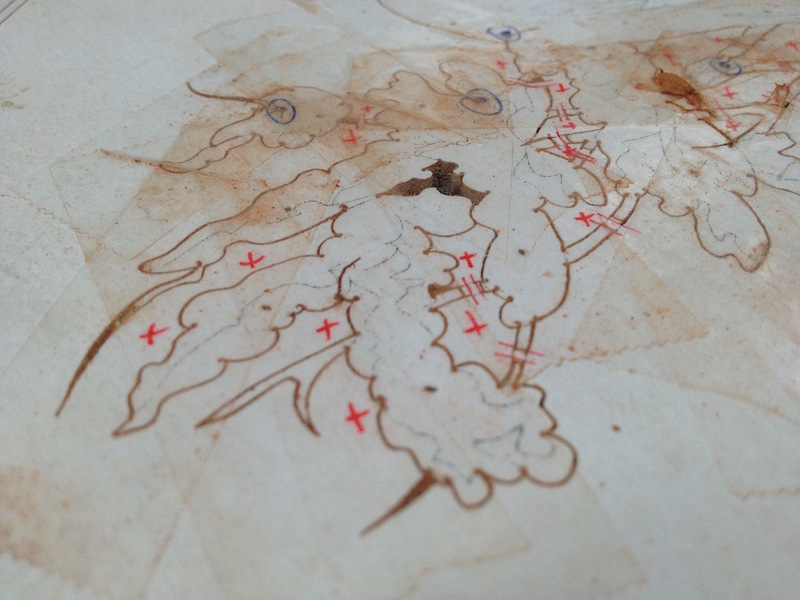 My favorite part, cleaning the paper ans see the picture for the first time appearing little by little. 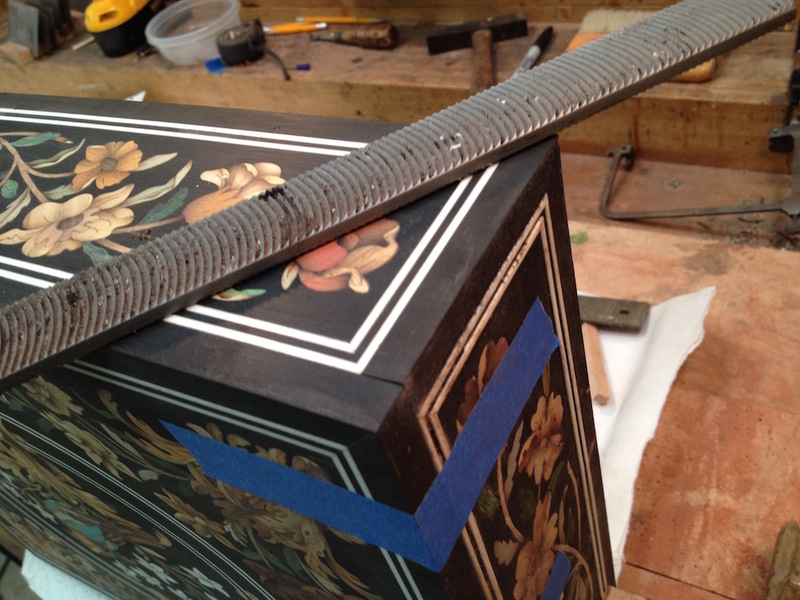 It is also the first time when almost everything is veneered that you can see if it looks like you envisioned it. 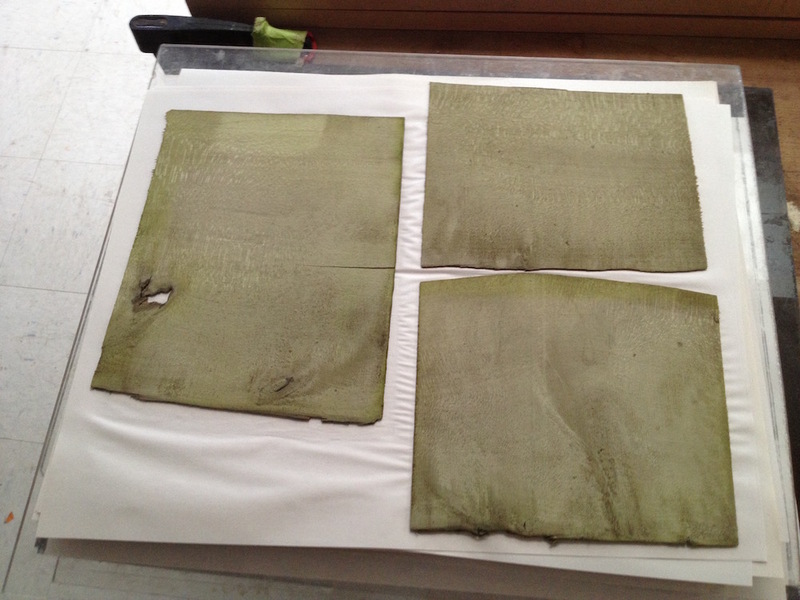 Time to pore fill. 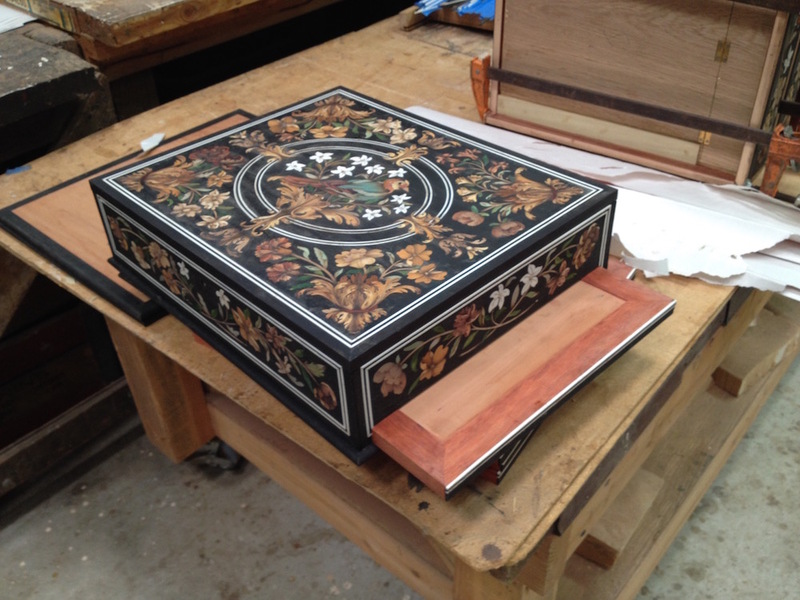 I started with the top and the inside of the lid, but more particularly the tray that we needed to send to LA to get the leather installed. 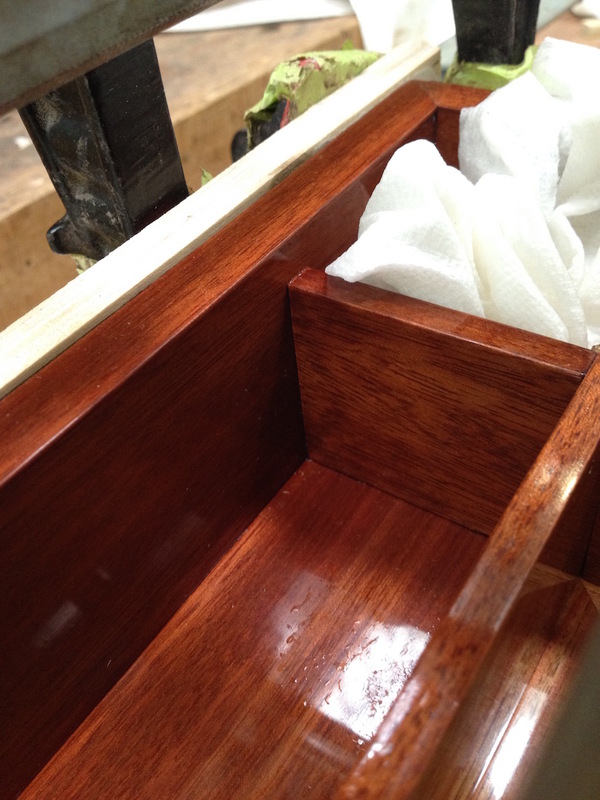 Couple days (week or weeks) to finish the polish. 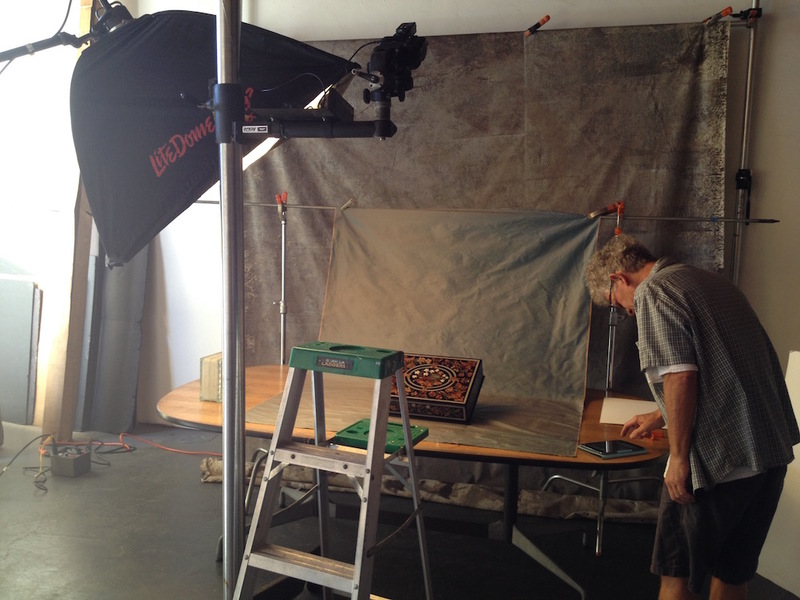 And it was already time (2 years of work) to take pictures. 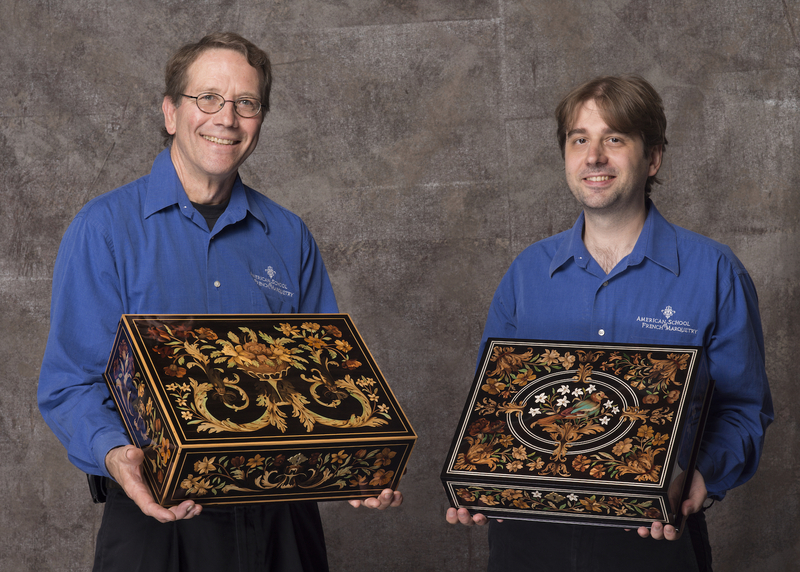 Patrick wanted to do a picture of the 2 of us so we borrowed a box from the first series for that purpose.